It has been more than a year since I last posted, and it would be an understatement to say we are working hard. SO much has happened in the past year! 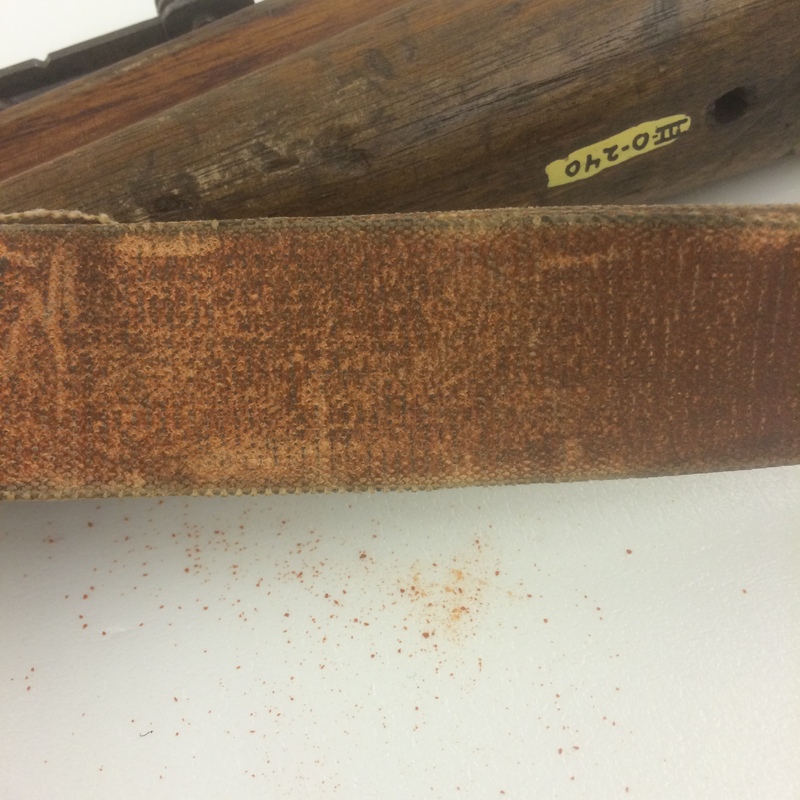 I promised myself I’d keep this one short and just get blogging again, so here is a glimpse of conservation from the Oil and Timber Section we recently installed. YES installed, Opening Day is June 6! How about this gorgeous chainsaw? Gotta start with an image of Alaska State Museum registrar Andrew Washburn, we’ve been with the artifacts through the whole process and keeping track of the info at breakneck pace. Documentation!!! And really interesting conversations about the strangeness of the out-of-context museum world and what it means for artifact interpretation. 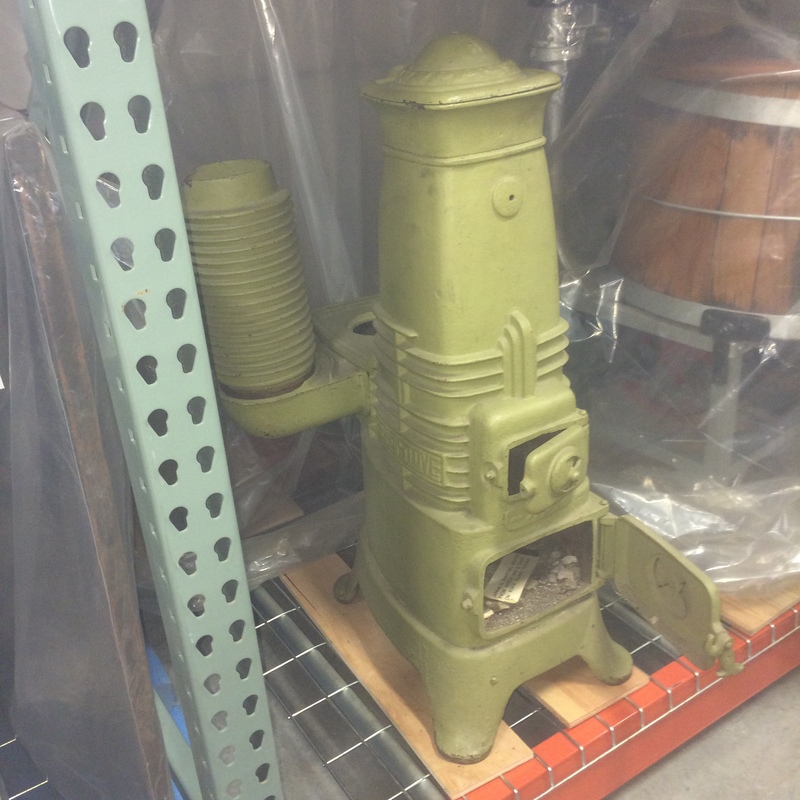 In conservation, we have been endeavoring to make industrial objects look reasonably cared for without removing evidence of their useful life. Andrew’s pose captures our discussion about which way the blade faces. Iron! Here we have a couple of boom chains. The blacker one was treated with OSPHO and the lighter one got a tannic acid treatment. Most of the iron that needed help from the collection got tannic acid and stayed brownish. The brown boom chain was the one selected for exhibition. Incidentally, there were some prop desk legs also treated with OSPHO…they accidentally got wet and a tough white substance showed up on the surface. So difficult to remove! Anyone have experience with that white crust? In general, I wouldn’t OSPHO a museum object but if a blackish appearance is desired a controlled phosphoric acid like OSPHO does the trick. If the white crust had happened on a museum object, that would have been a disaster. A giant round of spruce. For many many years this was an exhibit prop in the old museum and treated as such. When I came on staff in 2006, it was strapped to the basement wall and only recently been added to the permanent collection. This sturdy iron support had been added years ago to support a large crack. Note all the disfiguring drips. Most invasive treatment of my life: I took a Festool sander to the face of this spruce round to remove severe staining. I’ll spare you the long in-house decision making process that made that choice even possible, but suffice to say I am in love with Festool now. When the spruce round had been an exhibit prop, there were also large holes drilled to mark certain rings as a timeline. 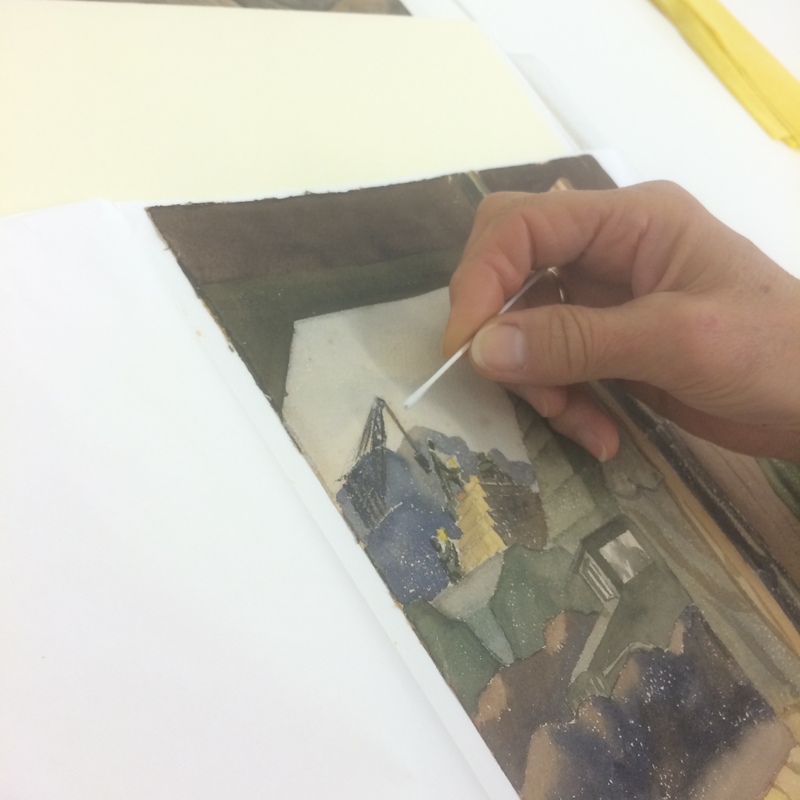 Paintings conservator Gwen Manthey is shown here filling and inpainting those holes. There were four holes, but I dare you to find them now! 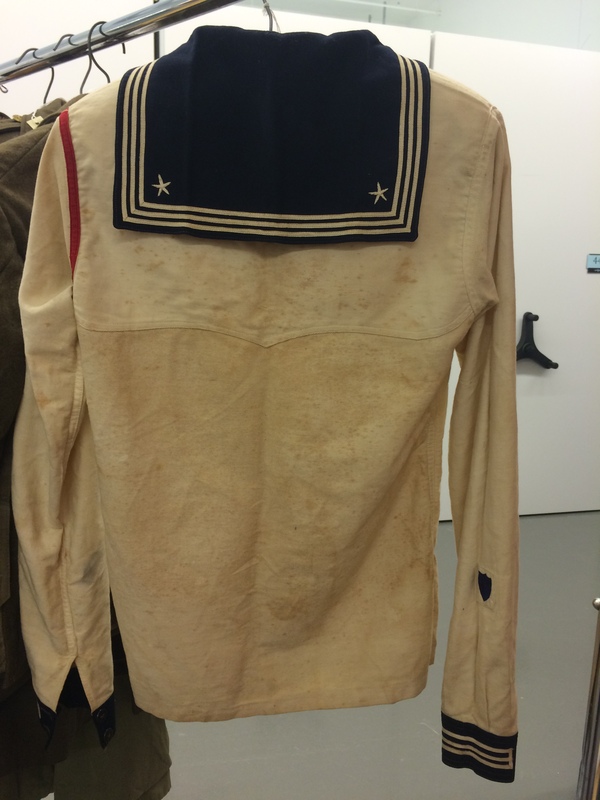 Here is the jacket Click Bishop wore back in his days working on the oil pipeline. Yes, that Click Bishop, the Alaska State Senator. There are pants and hat with this outfit too. 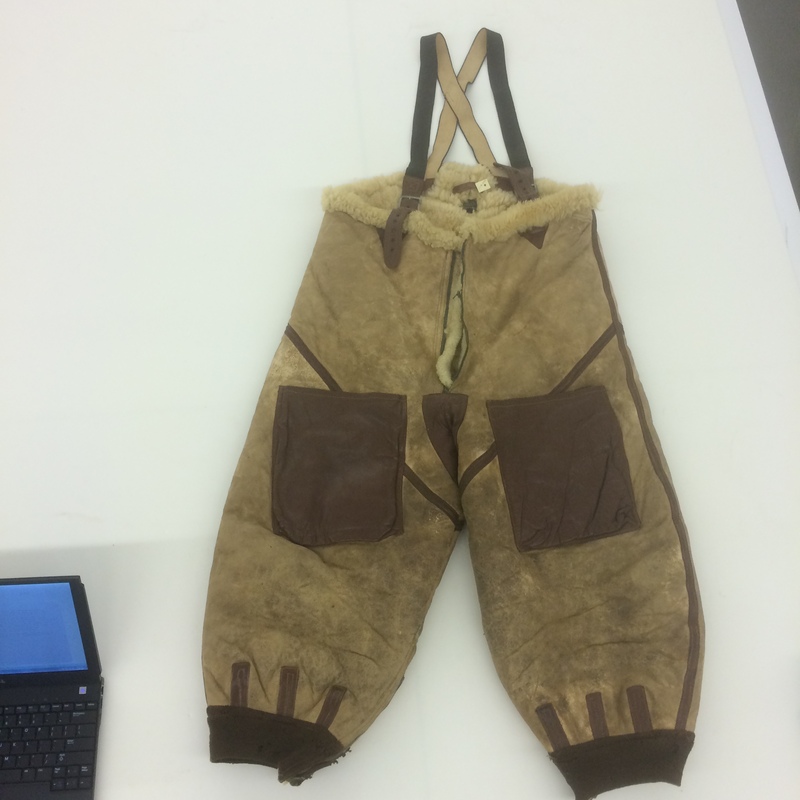 Here is an image of humidifying the pocket flaps so they would lay flat when the mannequin was dressed. 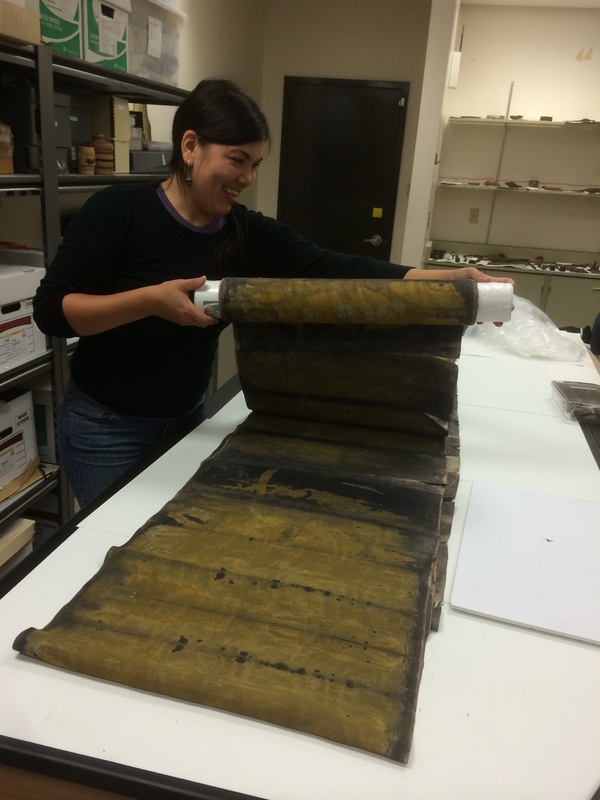 Paper conservator Karen Zukor came up in January to consult with us. Here she is explaining the issues with an artwork. L to R curator Steve Henrikson, exhibit curator Jackie Manning, back of my head, exhibit designer Aaron Elmore, exhibit coordinator Paul Gardinier, and Karen Zukor. Some Wonderwall specimens in foreground. More on that later! 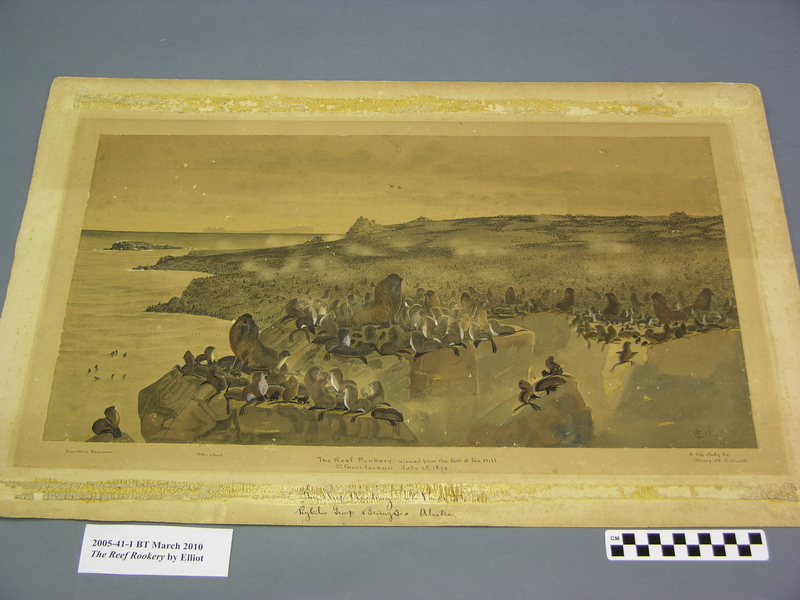 V-A-144 this image of the disaster at Lituya Bay was collected by Governor Heintzleman in France. It has some staining and mat issues that will require treatment. This is the image Karen was discussing in the previous pic. 95-37-4-3 chest Sometimes called a Russian Chest or a Chinese Chest, these camphorwood chests covered with painted leather tacked down with brass tacks were part of early trade and found now in many Alaskan museum collections. They almost always have the kind of damage seen here. Now for the walking tour! This is my desk in the State Office Building (folks here call it the SOB and they don’t even snicker). This is the front section of my temporary lab space. It is an alternately exploding and collapsing universe of clutter. It will be tidier when interns come…for a while. This is the SOB atrium, where folks can get coffee, snacks, and free wifi. 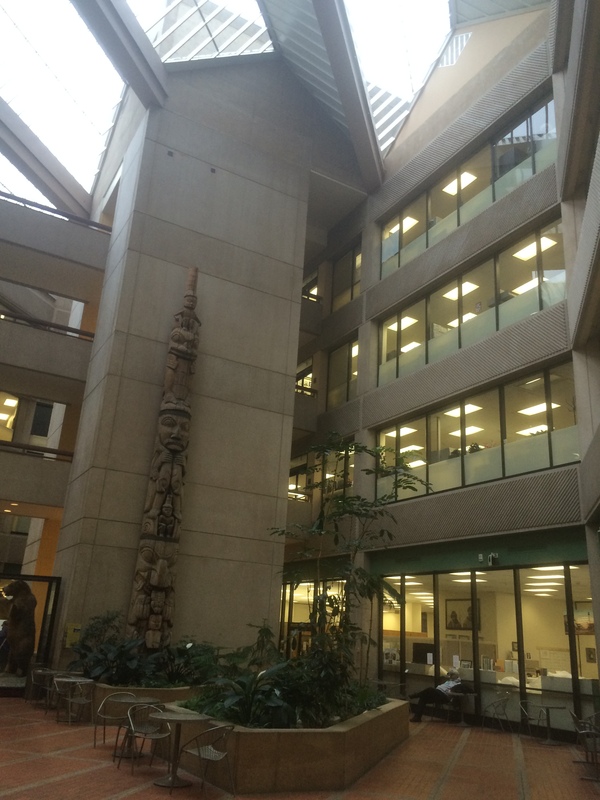 That Haida totem pole by Dwight Wallace is in the museum collections (II-B-1632) but is not moving. 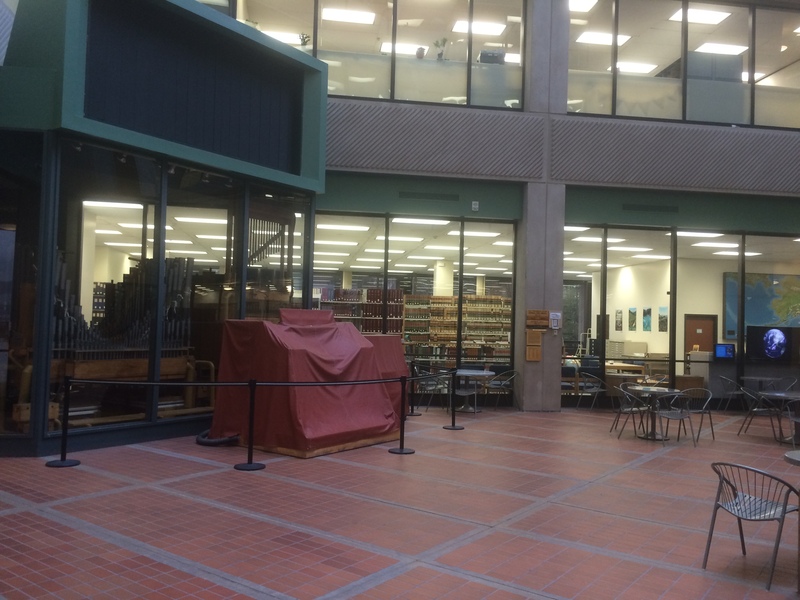 That organ under cover and its pipes in the chamber are in the museum collections too (III-O-688) but not moving. You can hear it played live most Fridays over the lunch hour. This is the P2 level entrance of the SOB, where we exit to head over to the Vault. As you leave the SOB, you see Bullwinkle’s, which is great for after work pizza, popcorn and a pitcher with co-workers. Next door is the Twilight Café, which has my favorite Americano in town and a divine pork adobo burrito. We cut across this parking lot to go toward the Vault. 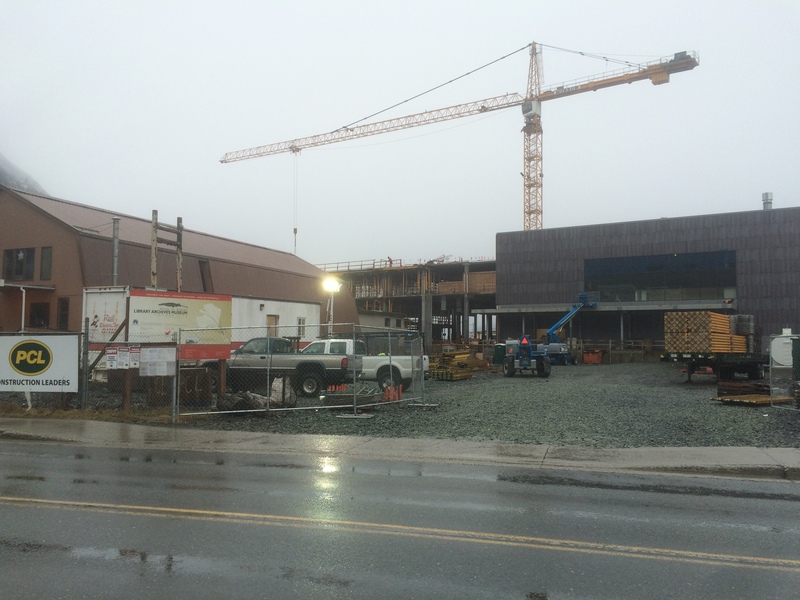 Here is the site of the new building as it looks on a rainy Thursday, March 5, 2015. 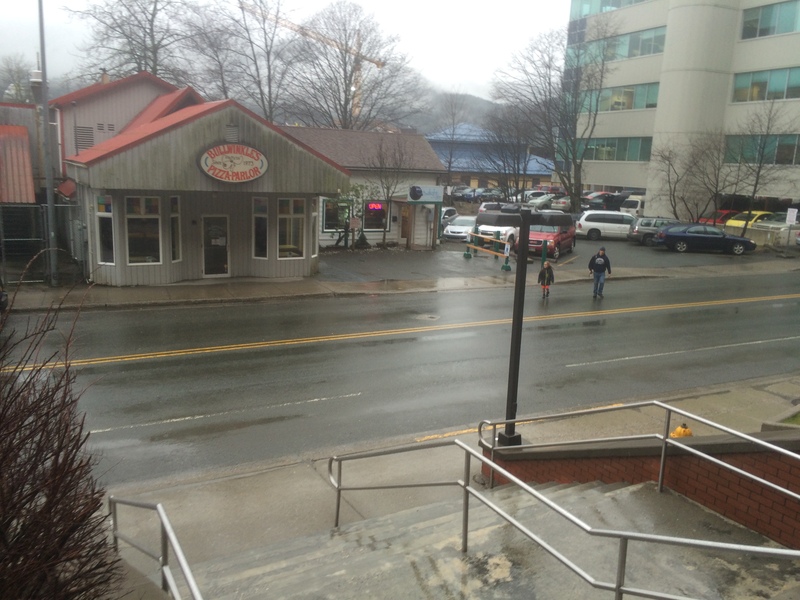 The weather may at times be that lousy this summer, but hopefully there will be sunny days, too. 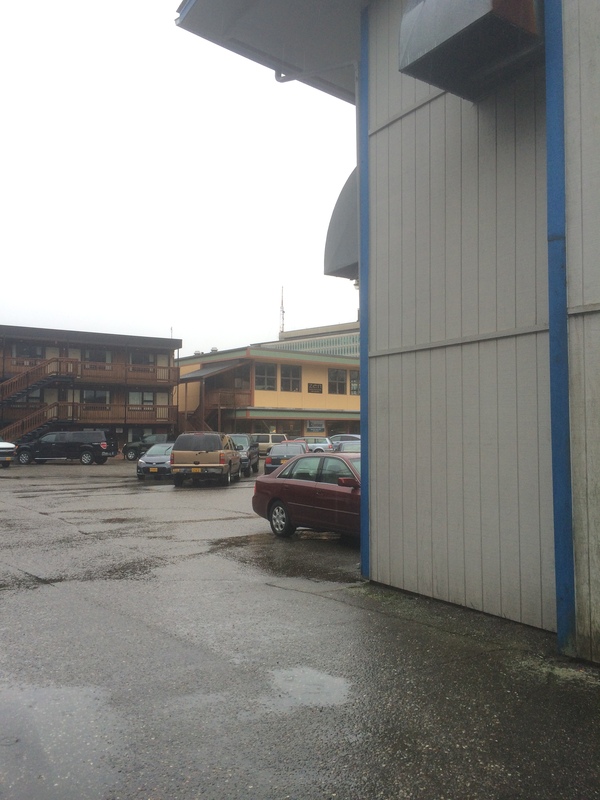 This is the side of the building, and right around where the blue tarps are is the future conservation lab area. Oops, wait, turn around! Some orientation. The tallest building in the background, behind the blue and yellowish one, is the SOB. The blue one on the hill is the fisherman’s lobbyist building. And the reddish orange one is my house! 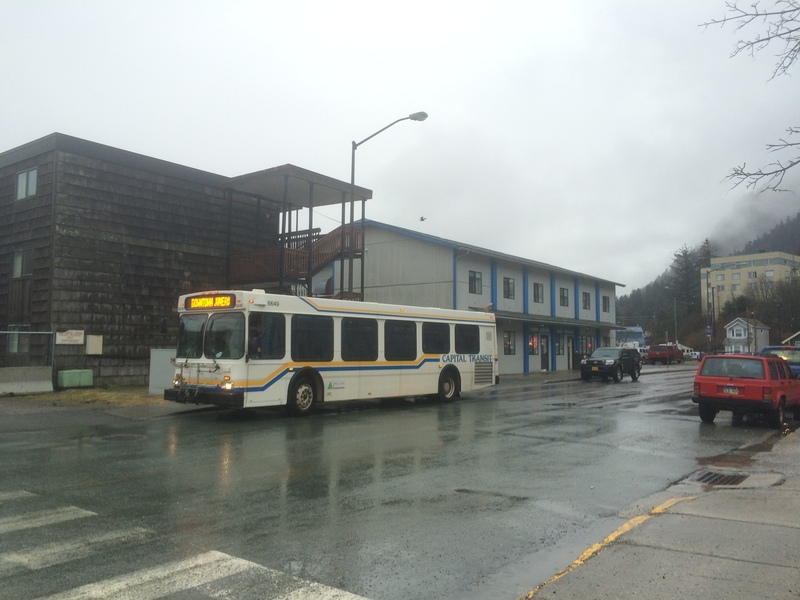 There’s the bus, it stops several places near the site. And the building with the blue stripes is Thibodeau’s, which has a convenience store for sandwiches and coffee and friendly banter with Henry. Just past the Sandpiper a bit you’ll see the Vault, the completed section of the SLAM building that houses our collections. 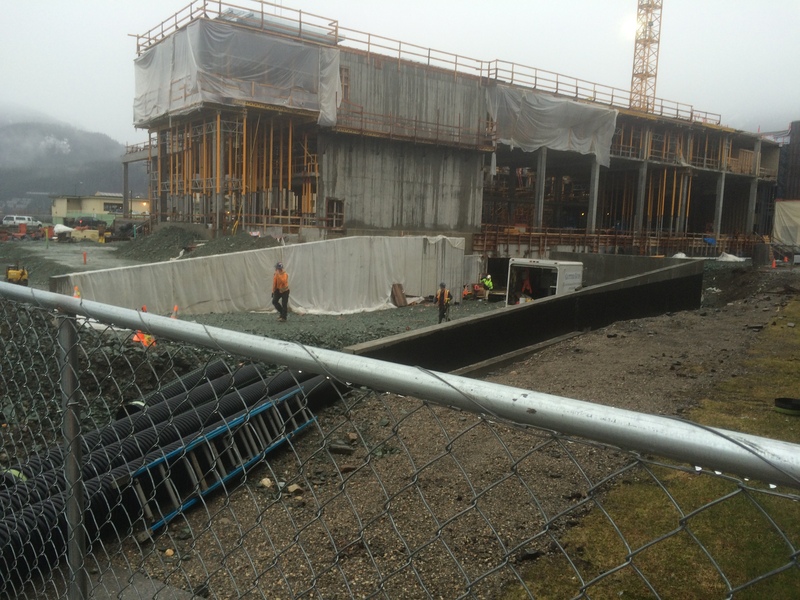 We need PPE to get on site, including a hard hat, orange vest, goggles, and sturdy shoes. 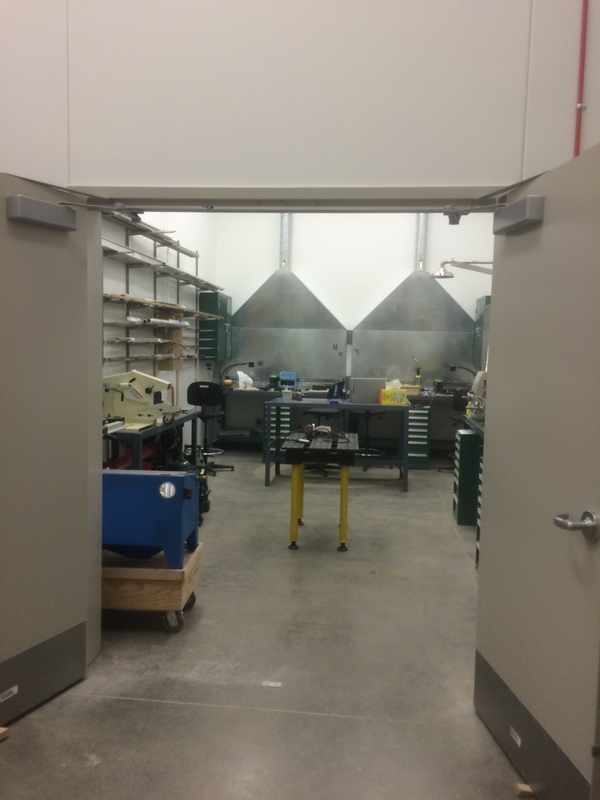 We enter the Vault through the exhibits shop, which is still being set up. 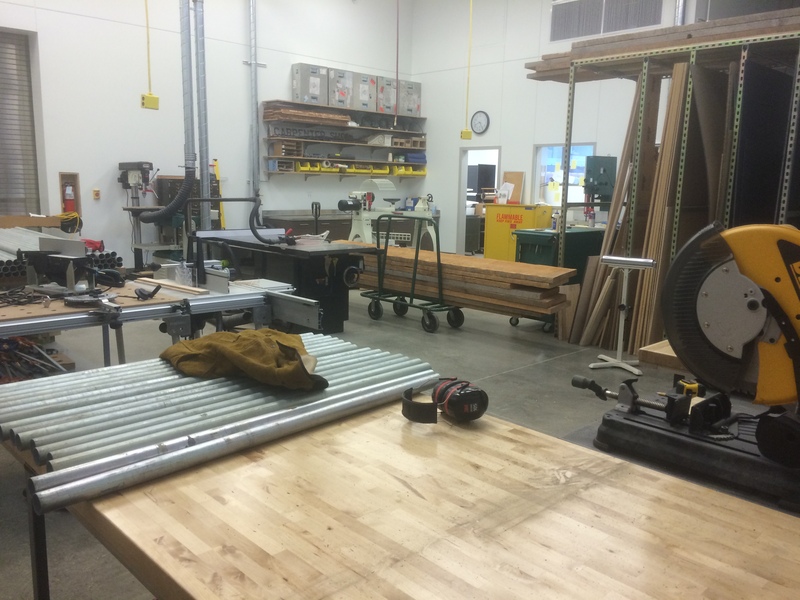 This is the metals section of the shop, where a LOT of mount making is going to be happening this summer. It just started in earnest last week! 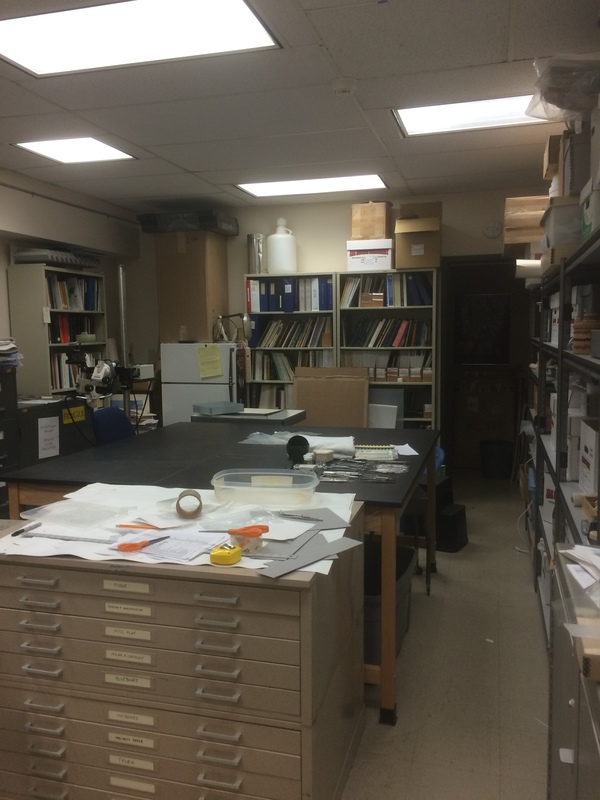 Here’s the Collections Processing Room (CPR) where the layouts, photography, and incoming objects are dealt with. 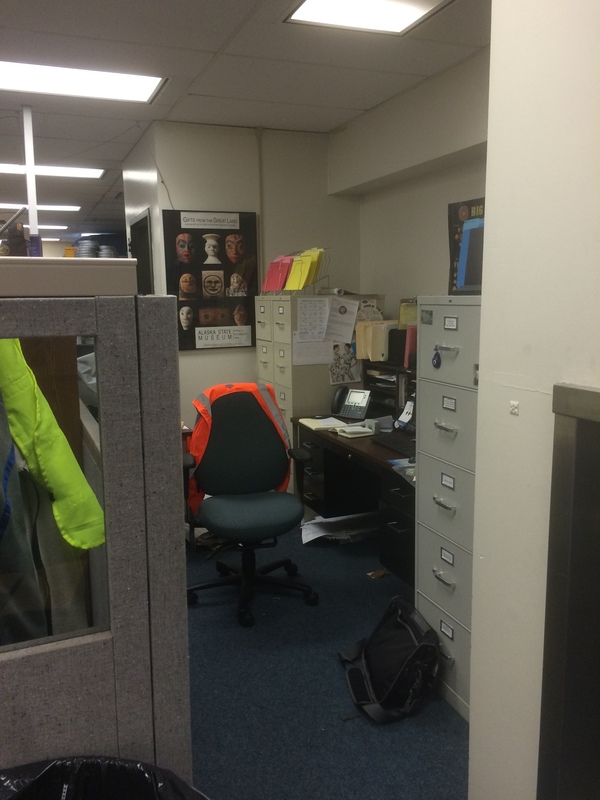 Eventually when we are allowed to have workstations in the Vault this will be the office of Andrew Washburn. In the meantime, he has generously offered to let the conservation team use the space. Obviously I have to prepare it a bit…things are in flux. 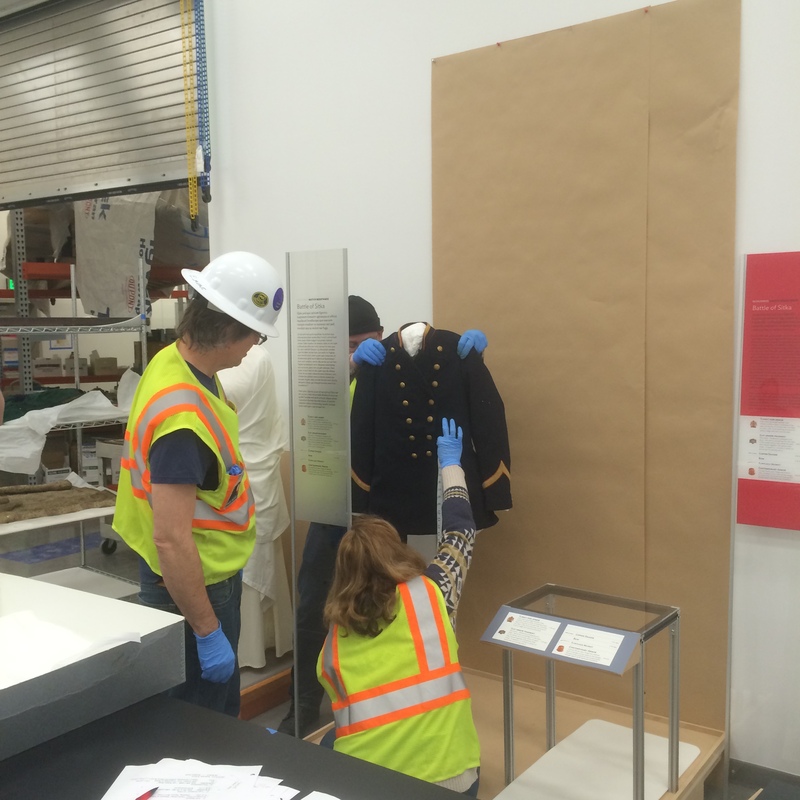 Here’s a snapshot of some of the conservation work ahead for the Russian America section of our upcoming new exhibits. 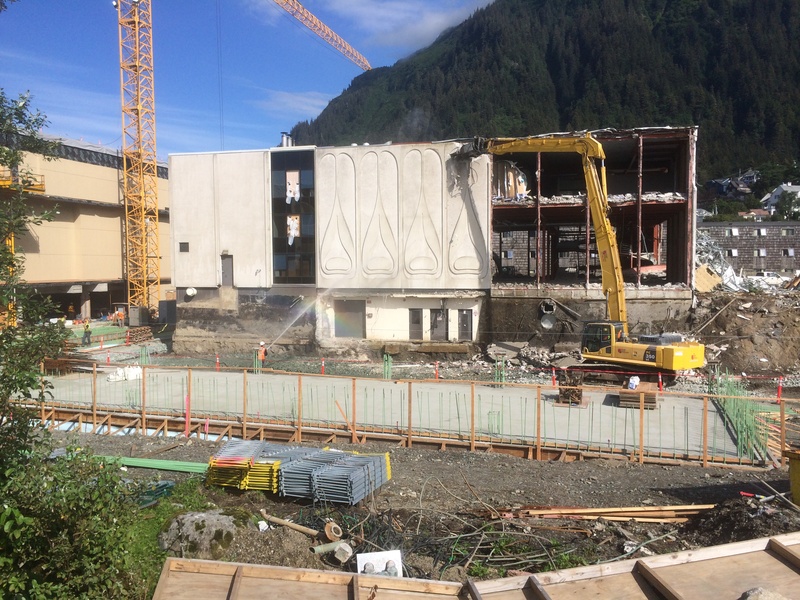 The Alaska State Library Archives and Museum (SLAM) project is in the construction phase, with opening of the new building planned for June 2016. There are approximately 22 interpretive areas, around 90 exhibit cases, and roughly 2,500 objects. As I write this, we are beginning the ninth physical layout. The wool of the flag sheds readily, and is rather delicate. 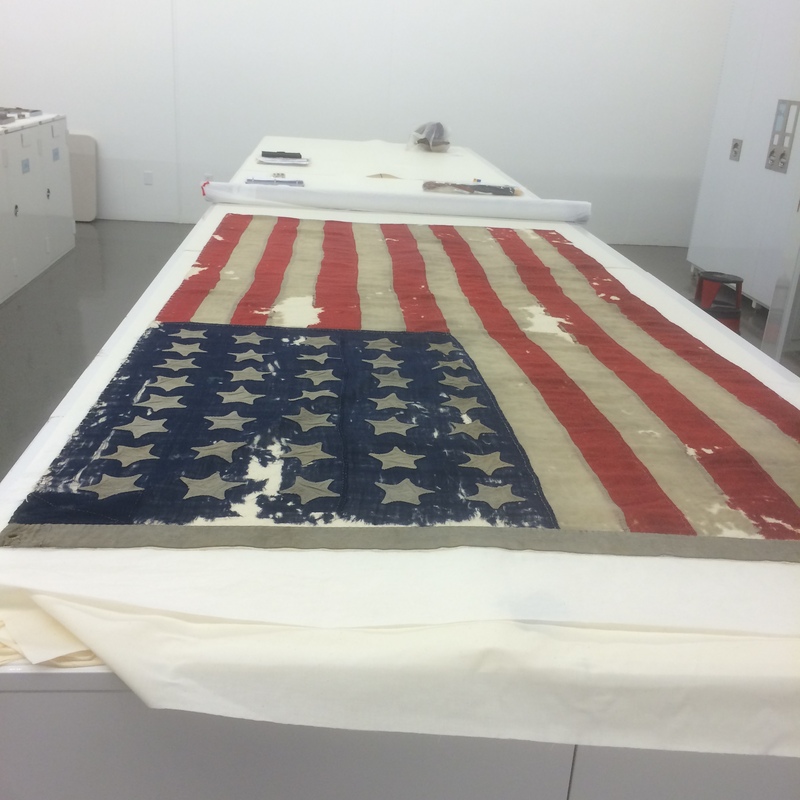 Records suggest the flag was stitched down to a support fabric of linen some time in the 1930s. 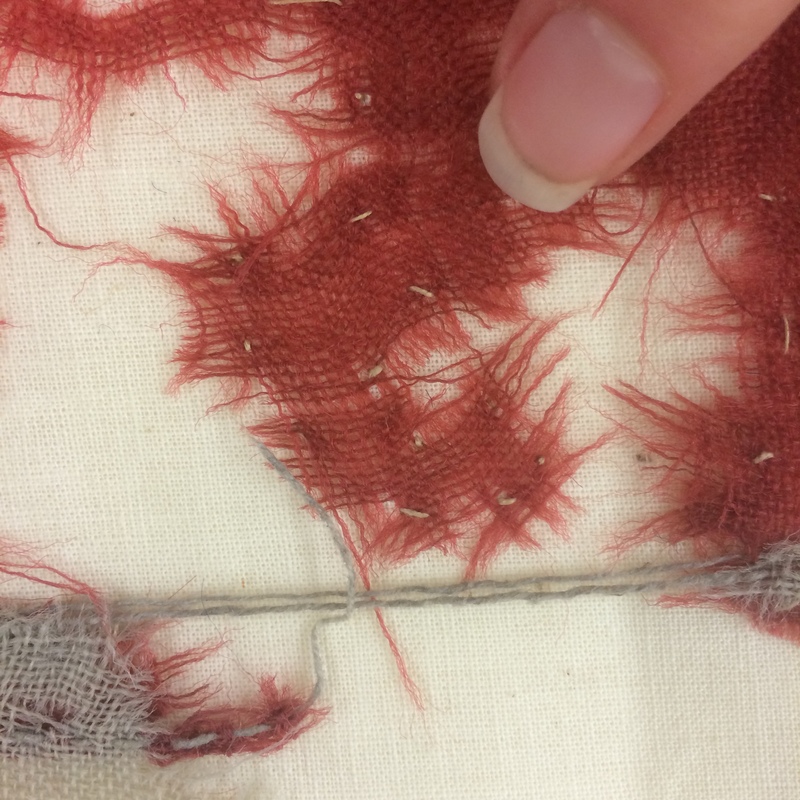 These stitches are not sufficient to allow the flag to be displayed at an incline as we would like, so some additional couching stitches will need to be added in many locations. 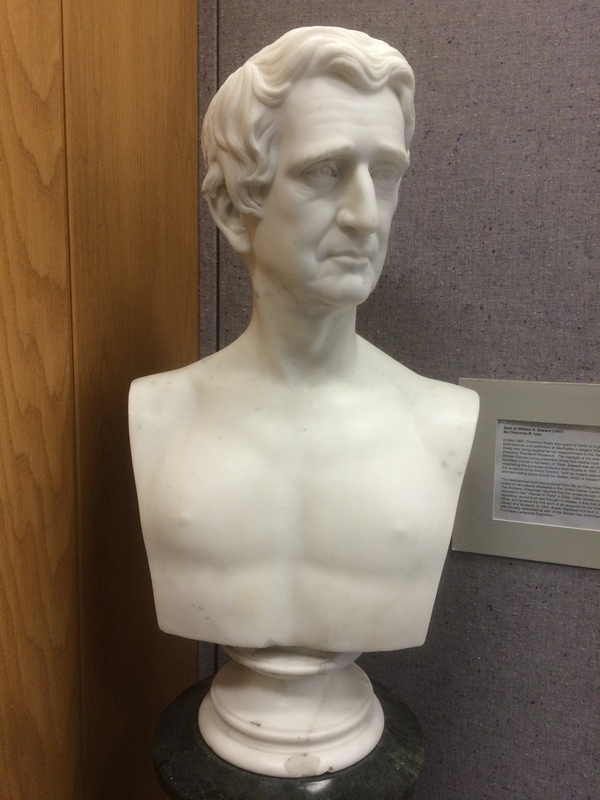 This bust of William Seward by Chauncey Bradley Ives has long been in the entry to the Alaska State Library’s Historical Collection, but will now help interpret Alaska’s political history. The stone is shockingly grimy. 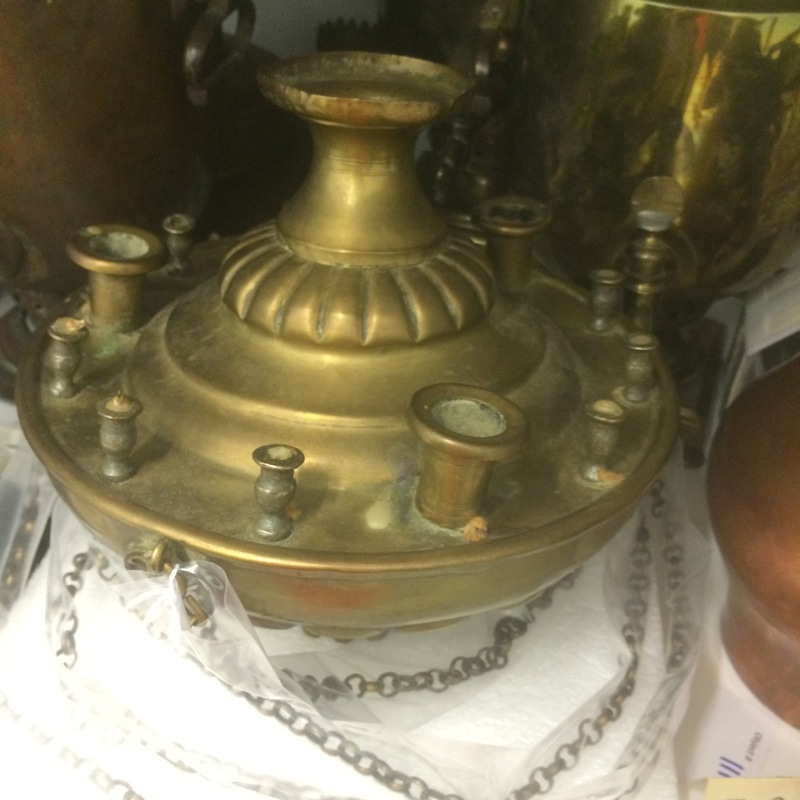 Many of the metals in the Russian America section have corrosion, polishing residues, failing lacquers, and other issues common to historic metals. 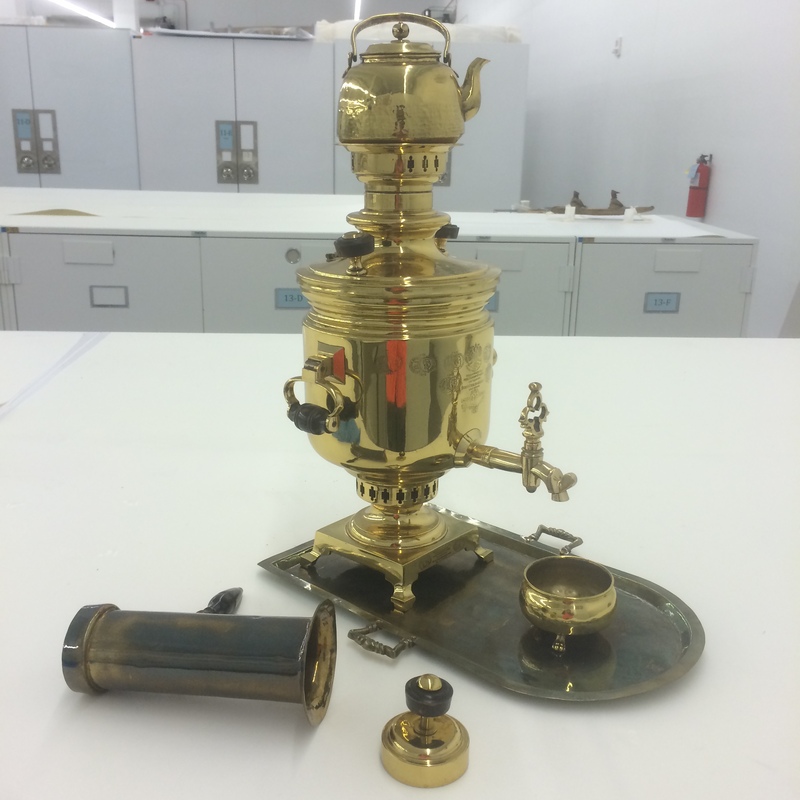 This samovar, ASM III-R-319, has a few of these issues on some components. 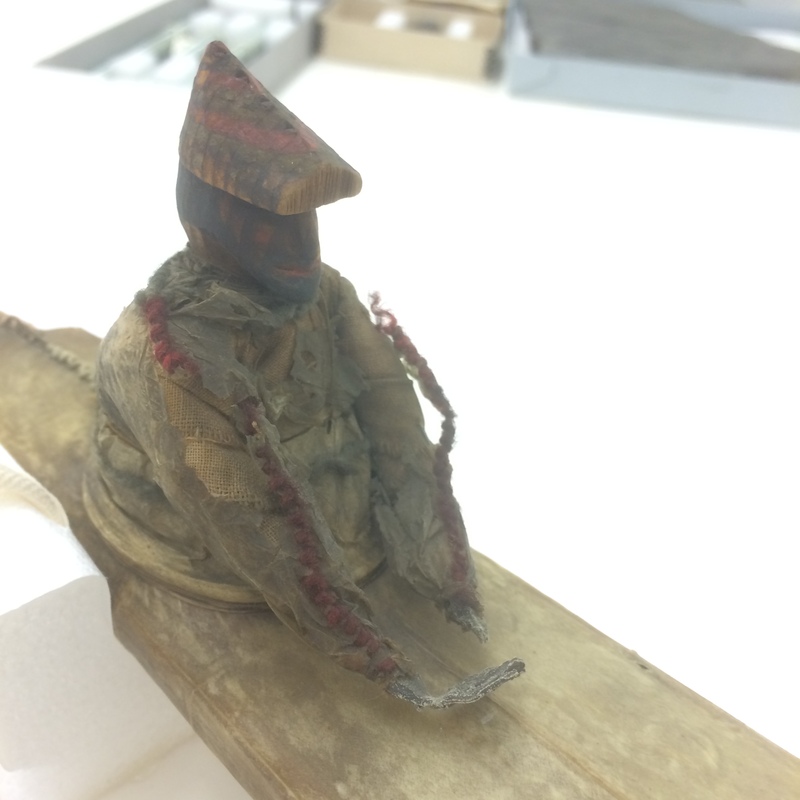 This poor little Unangan (Aleut) kayaker has quite a few condition issues. 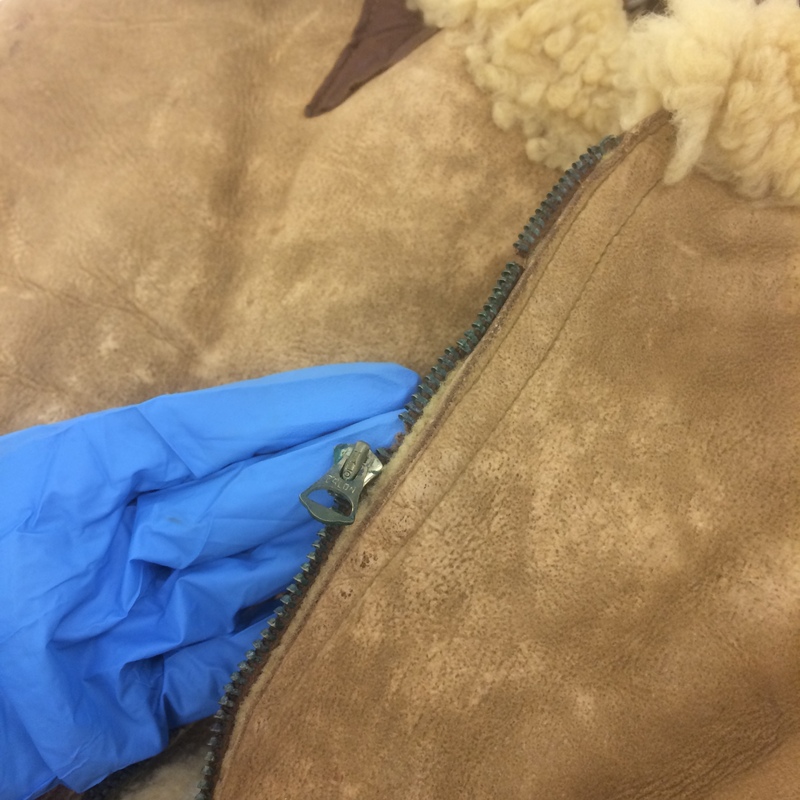 His lead hands are corroding, his visor has a broken off tip, the gutskin parka he is wearing has some old insect damage, and he is heavily soiled. ASM II-F-272. 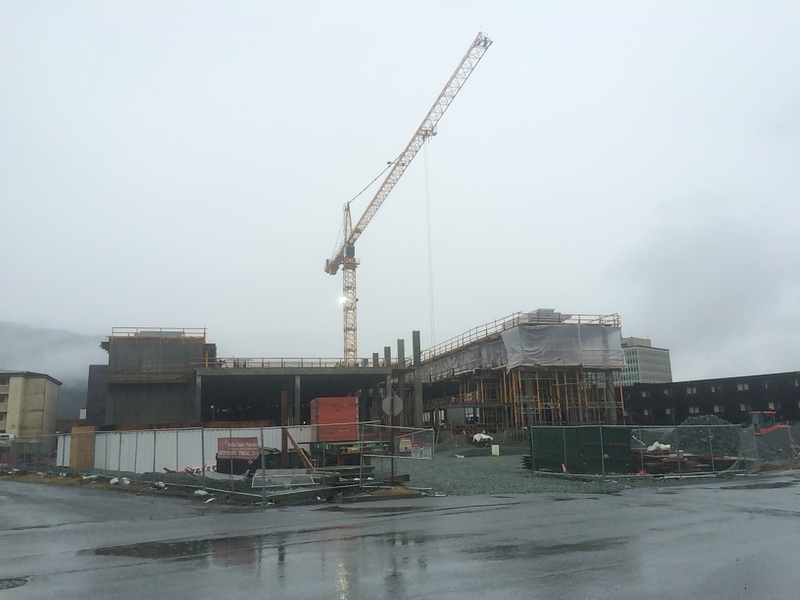 The Alaska State Library Archives and Museum (SLAM) project is in the construction phase, with opening of the new building planned for June 2016. We are preparing collections for exhibit. There are approximately 22 interpretive areas, around 90 exhibit cases, and roughly 2,500 objects. As I write this, we are beginning the ninth physical layout. 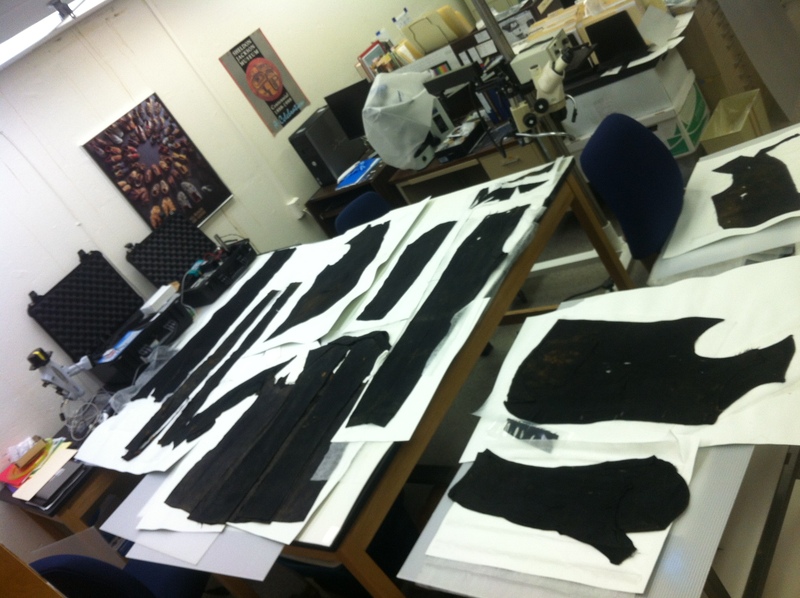 Here are some of the conservation tasks identified from the first layout and a glimpse of our process. I hope to post regularly for each of these sections. Stay tuned! 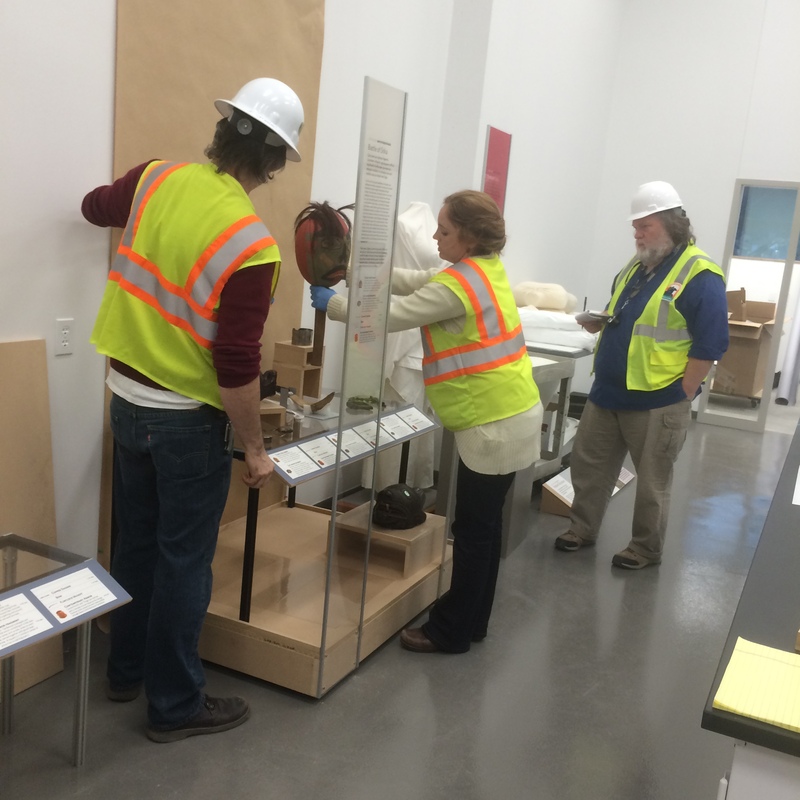 From L to R: exhibit designer Aaron Elmore, exhibits curator Jackie Manning and curator Steve Henrikson working together on the layout for the Resilience section of the new exhibits. Jackie measures Kow.ee’s police uniform (ASM III-O-416) while registrar Andrew Washburn holds it up. Hardhats and loud vests are due to the collections storage and processing areas being in the middle of an active construction zone. In order to access the site, we are required to wear protective gear. 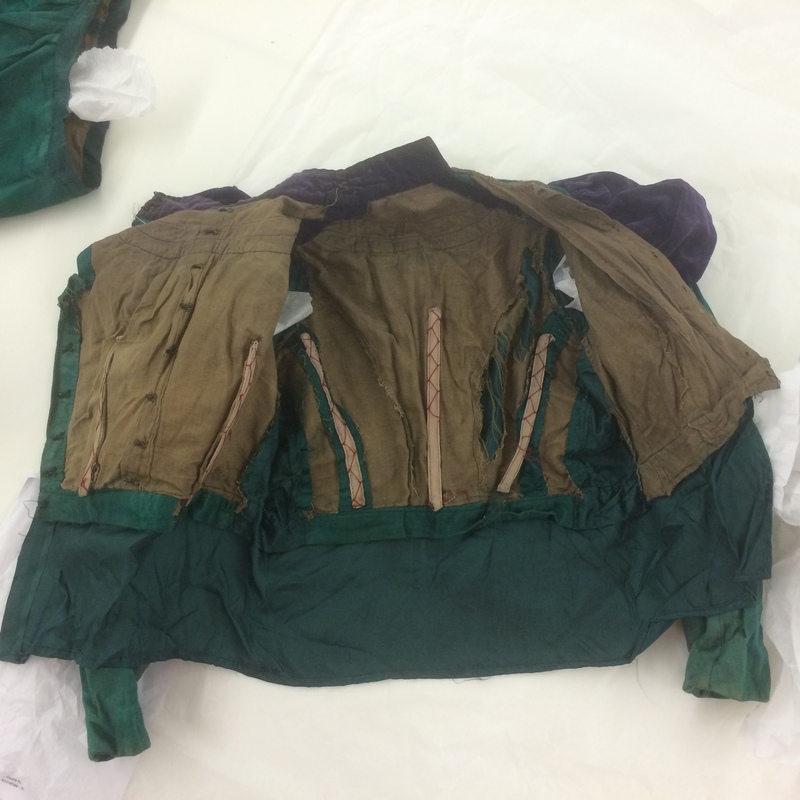 The dress has baleen stays inside, some of which are loose, as well as some wear and tear. This will be stabilized before it is put on a mannequin. Gearing up for making dozens of mannequins is starting now, too. 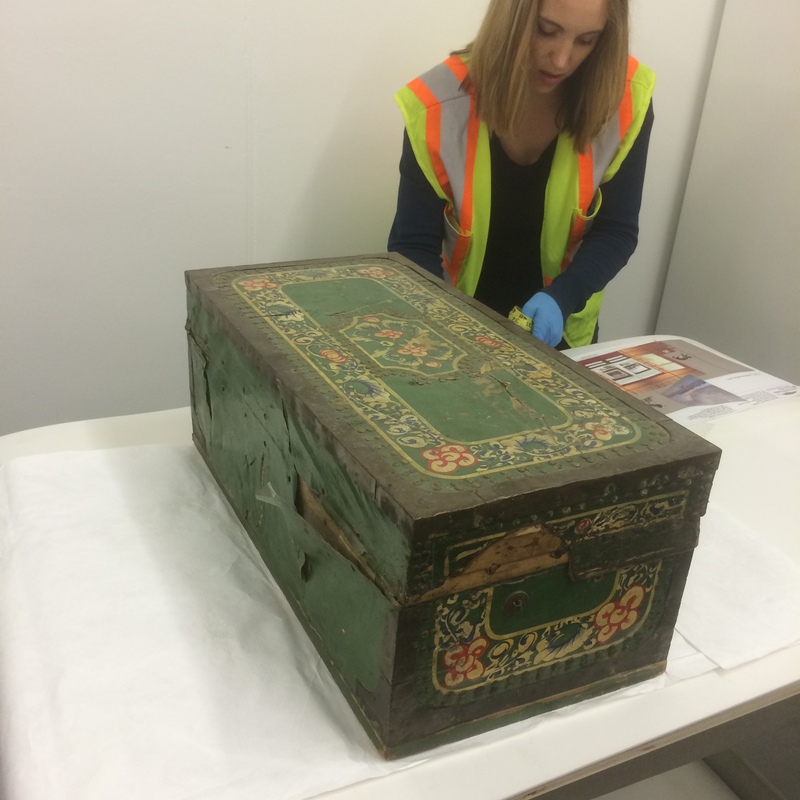 Several of our Russian Orthodox icons had loose and flaking paint, expertly stabilized on site during a visit by paintings conservator Gwen Manthey. 2013 was packed! This is the most delayed I’ve ever posted a Top Ten list yet…yikes! Most of this work is completed, but some of it is still in stream. Our eagle beaks and feet have not quite all been treated, but thanks to our custom QP card we now know the proper color range. These eagles, the snack food store, the dump, and dozens of live bald eagles are all within a small radius of space here in Juneau…coincidence? 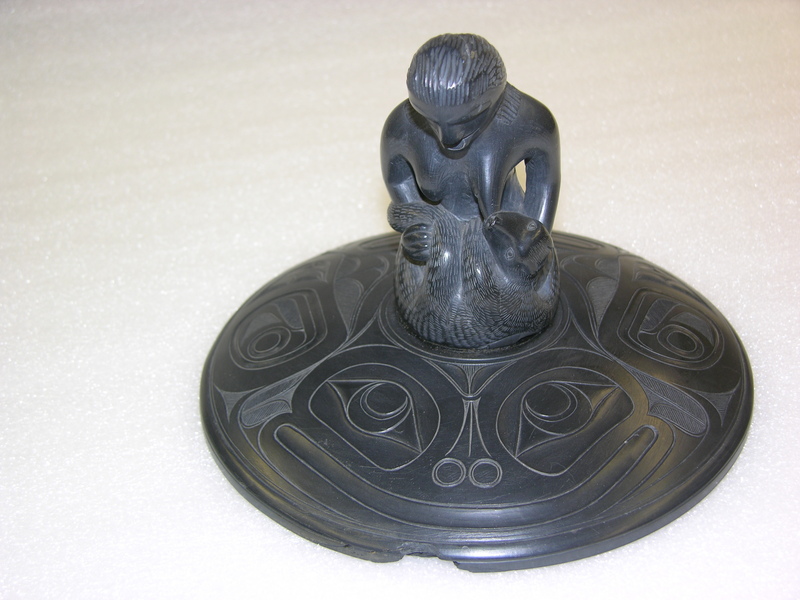 Several important pieces of argillite carving by Charles Edenshaw safely returned to Alaska from a loan to the Vancouver Art Gallery for their fabulous exhibition on the Haida master artist. 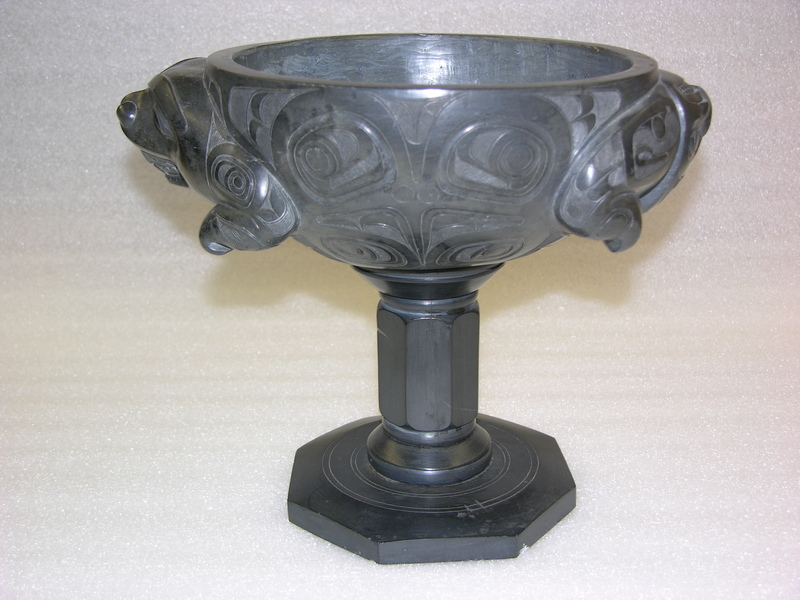 I’d love to write this up more in-depth soon…from a conservator’s point of view, argillite is unpredictable, fragile, and complicated to repair. Allowing these large heavy pieces to travel made me nervous, and even more so when my favorite solution wouldn’t fit the budget. As a compromise, the VAG sent Dwight Koss and Rory Gylander to pack and help courier the pieces. They did a splendid job, the artworks were made more accessible to the source community via exhibition and catalog, and back again safe and sound. How did we do it? If you were at the Western Association for Art Conservation (WAAC) conference in San Francisco this year, you got to see the PowerPoint. 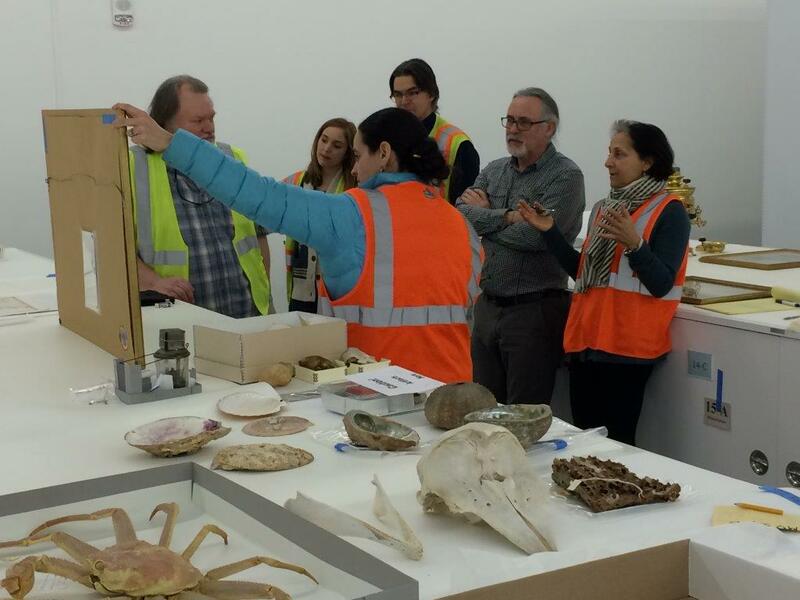 In a nutshell, Scott Carrlee wrote an IMLS Museums for America grant to bring dozens of museum professionals from across Alaska to come help us pack and move as a hands-on training and networking opportunity. Win-win for everyone. We had a six-week window to move about 40,000 objects, and utilized the Incident Command System to coordinate the effort. 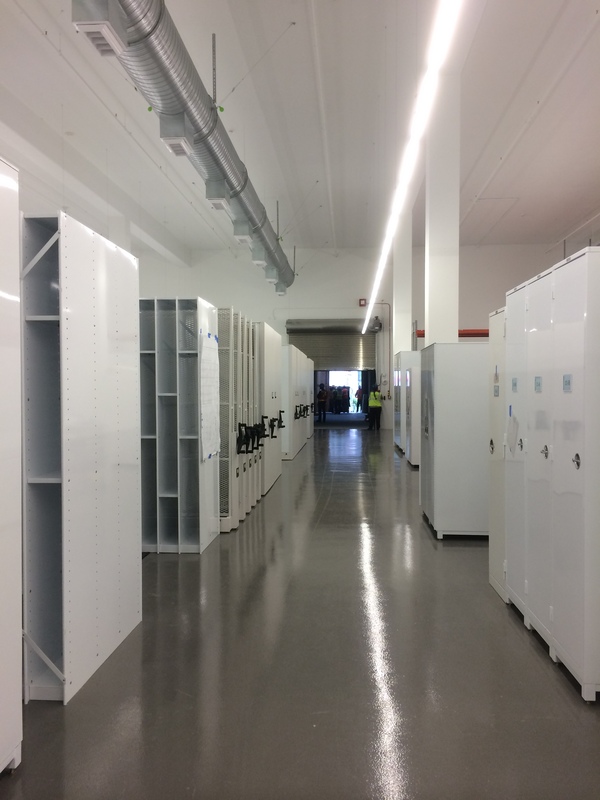 The collections were moved into the new vault (in the midst of a construction zone) through a tunnel built of shipping containers. 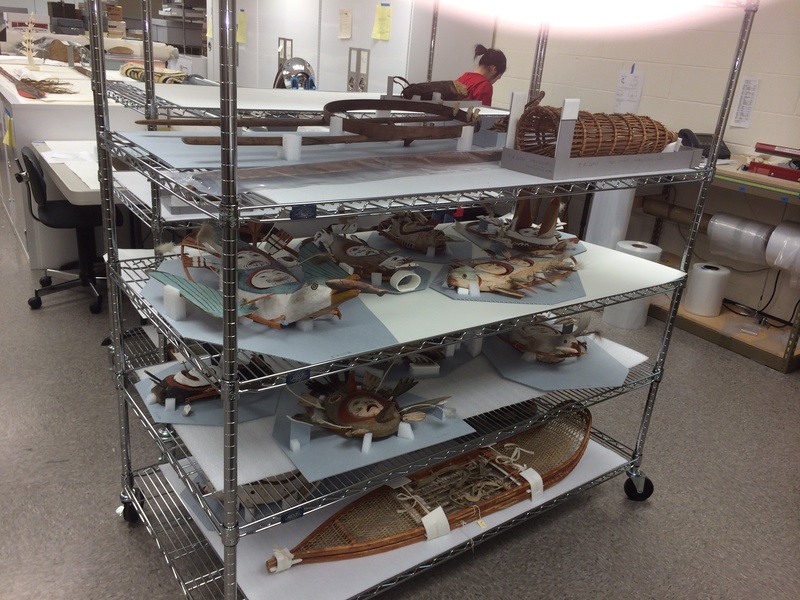 One of the final objects to move was a 35-foot walrus skin boat. 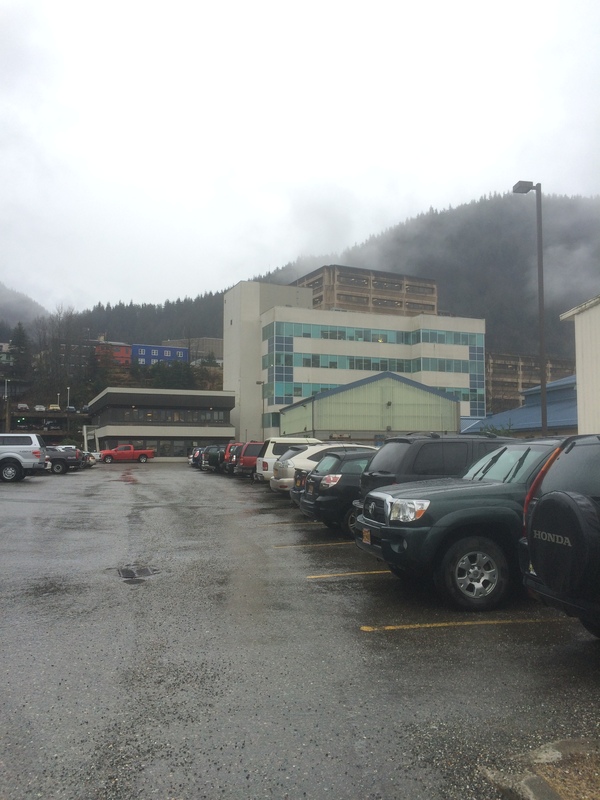 You can see photos and read the story in the Juneau Empire: Airborne Umiak Sails Over Museum. 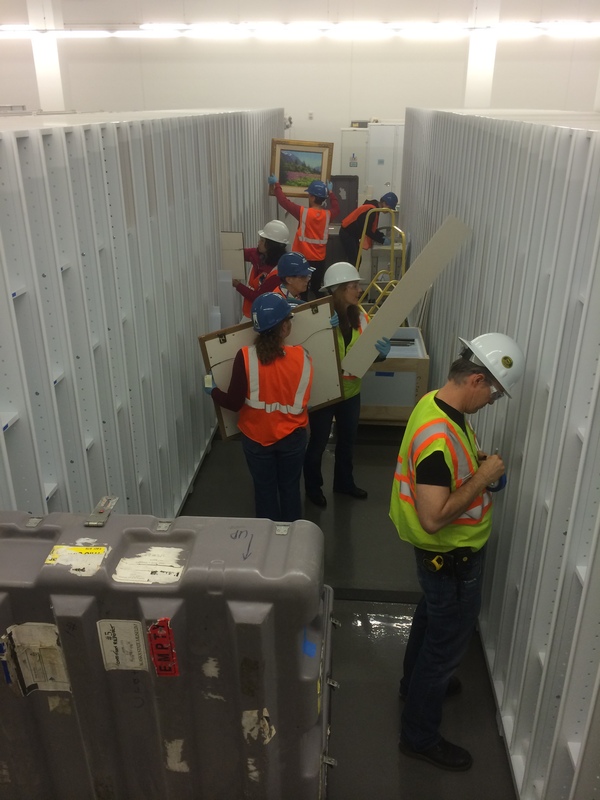 …you can breathe a bittersweet sigh of relief knowing all the collections were removed just a few short weeks ago. This image shows the old building coming down at the same time the new one is being erected. 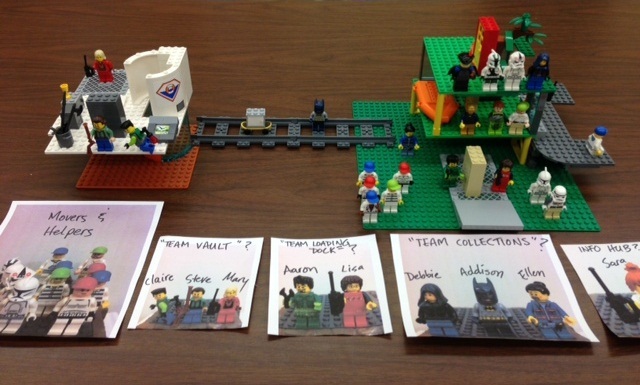 To the left of the image is the storage vault, already completed with the artifacts securely inside. Goodbye old building, we will miss you! 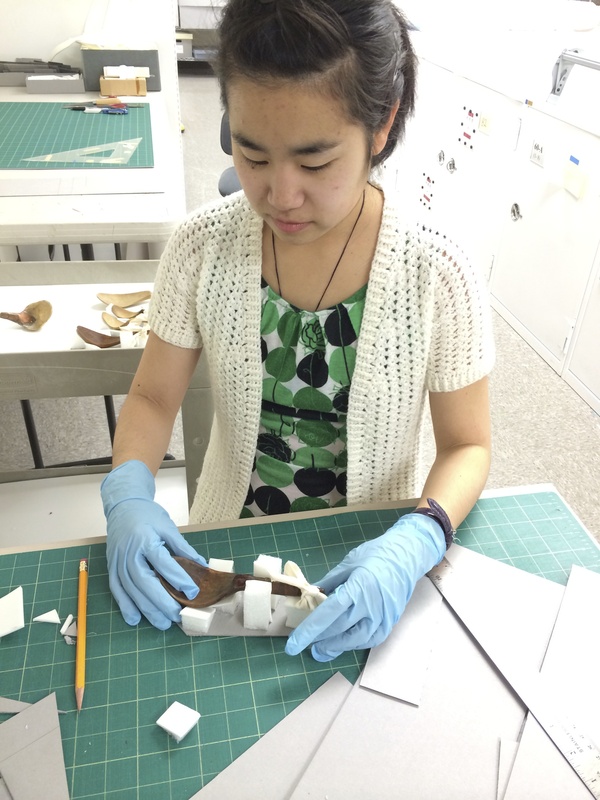 …and Lisa Imamura gets into conservation grad school at Queen’s! With a Master’s degree in geology already in her back pocket, Lisa decided she’d prefer a career in conservation to a PhD in geology and began volunteering in the conservation department at the Alaska State Museum scrubbing rusty dirty wet shipwreck material. That was back in late 2012. She wore more hats in several areas of the museum (some of them even paid!) and she was a core member of the museum move team. A total dynamo. Towards the end, we let her work on picking garish paint off eagle feet. She’s gonna be embarrassed I posted this, but Lisa take heart! I chose a picture with a cute outfit and not your shipwreck-scrubbing gear! …STAY FOR THE POLAR BEAR TONGUE! 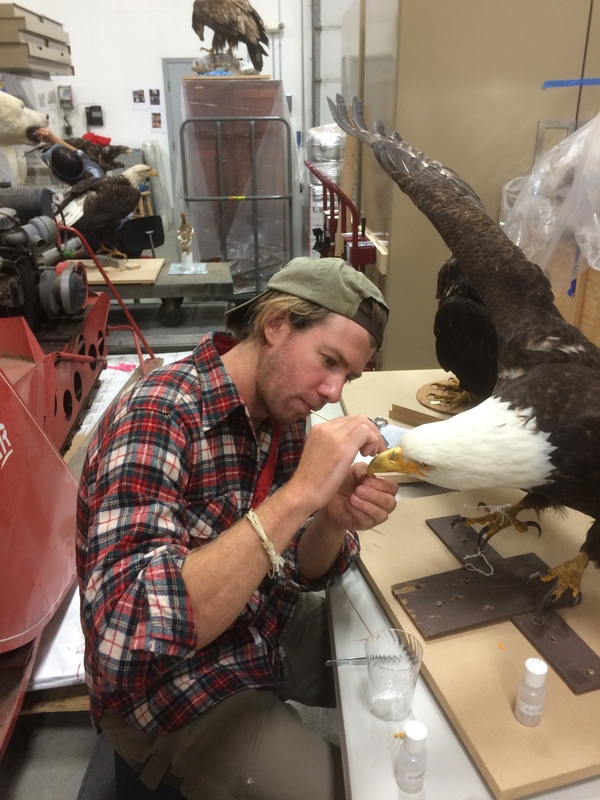 UCLA/ Getty graduate conservation student Tom McClintock took on a pile of motley tasks in his six weeks at the Alaska State Museum this summer, including eagles, basketry hats, shipwrecked carpenter’s polka dot pajamas, and moving many artifacts ranging from fine art to a large fishing boat. In this challenging transition time, Tom’s skills, flexibility, and roll-with-it attitude were the perfect fit. He even did dogsitting, bread baking and blueberry jam making for my boss’s boss’s boss. How’s that for making the conservation department look good?? Thanks Tom! 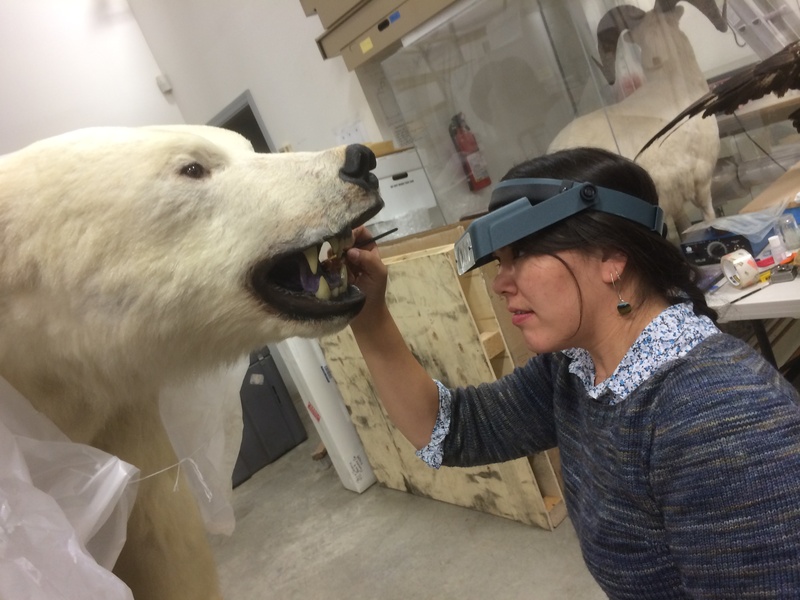 Conservator Fran Ritchie returned to Alaska this summer as part of a Rasmuson Foundation grant to help several institutions with taxidermy issues. (Check her work on a leatherback turtle in Cordova!) It was Fran who determined the treatment protocol for our seven eagles, advised on numerous specimens, and assisted with liberating several creatures from hideous old mounts. 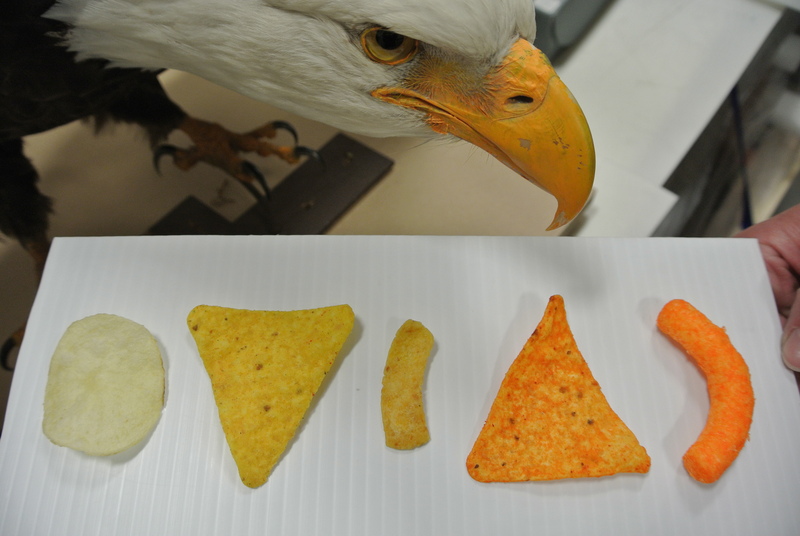 Why all the interest in natural history, you ask? 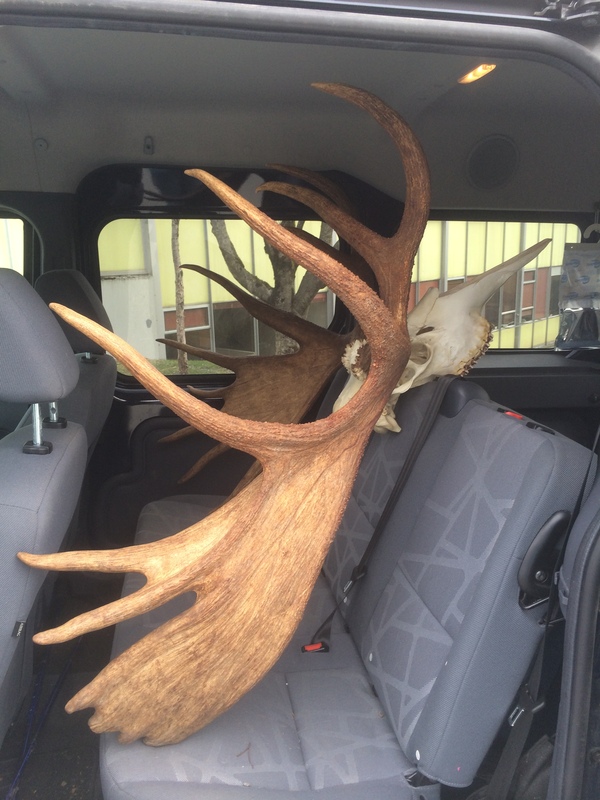 Antlers for acquisition delivered to the museum in the Carrlee’s trusty Ford Transit Connect. 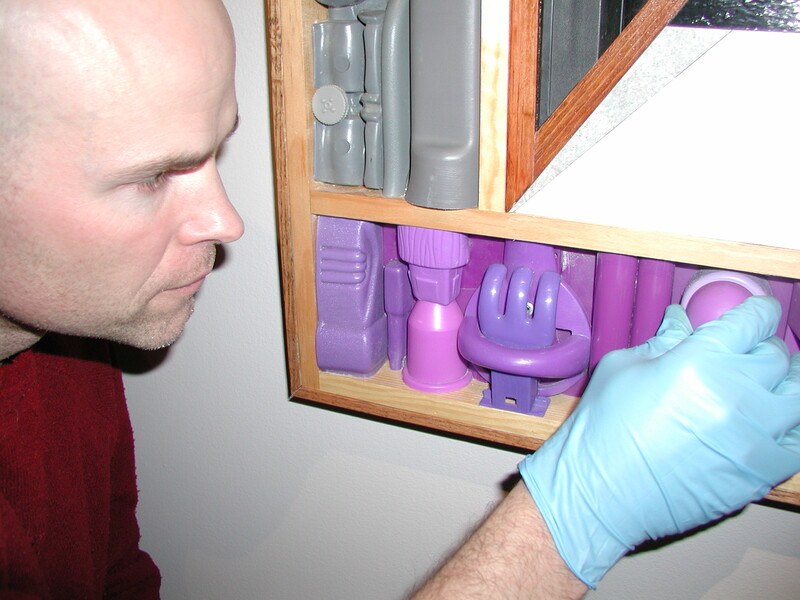 Conservator Scott Carrlee replaces an element from David Mollett’s “Collection Cabinet” (ASM 2005-29-1) after consultation with the artist in 2006. While a tremendous amount of our time is directed at the new building, we are thinking ahead as well. I co-presented a paper about artist intent with Sheldon Jackson Museum curator Jackie Fernandez at the Museums Alaska conference in Seward AK this fall. Many Alaskan museums have been actively collecting contemporary artwork, thanks the generosity of the Rasmuson Foundation Art Acquisition Initiative. Jackie interfaces quite a bit with artists who do residencies at the Sheldon Jackson Museum in Sitka, and she also helps select contemporary Alaskan art to add to the collection. 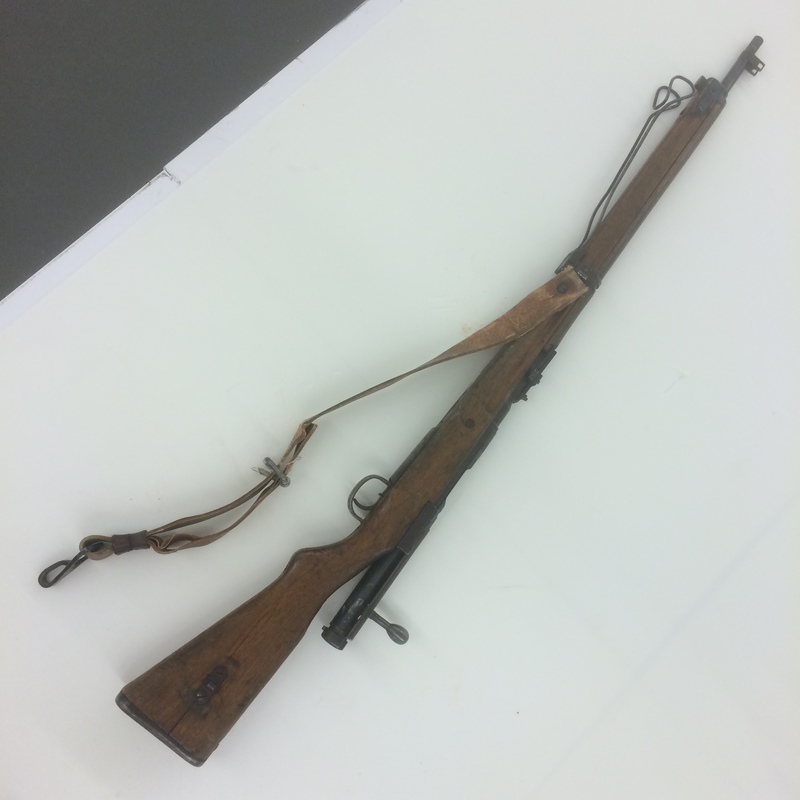 As part of the Alaska State Museums, that collection falls under our conservation duties. We are thinking of ways to proactively collect artist intent information about preservation and exhibition of these works. 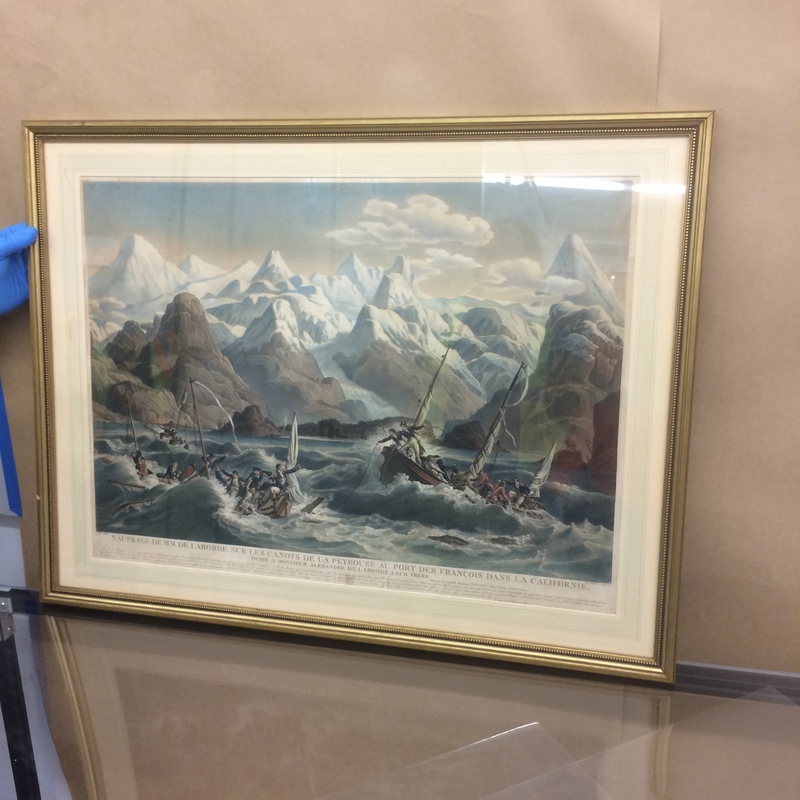 Since Alaskan museums often collect works from the same artist, it would be great to have a mechanism to share this information. Did I mention they are going to bust a hole in the basement wall of the museum and create a tunnel to the new storage vault? Guess whose conservation lab is in the way? So I will be moving my lab into temporary quarters in the next few months. 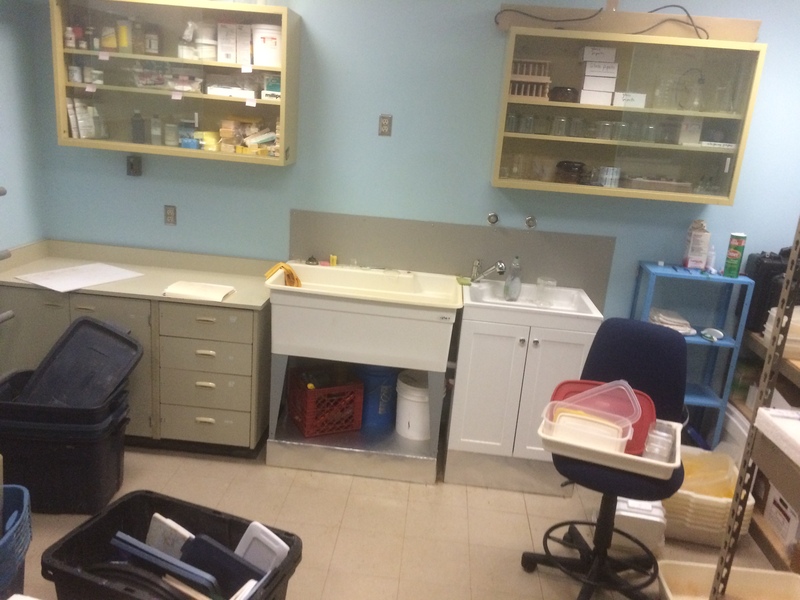 This lab has been here since 1976 and I have a LOT of accumulated goodness to move. 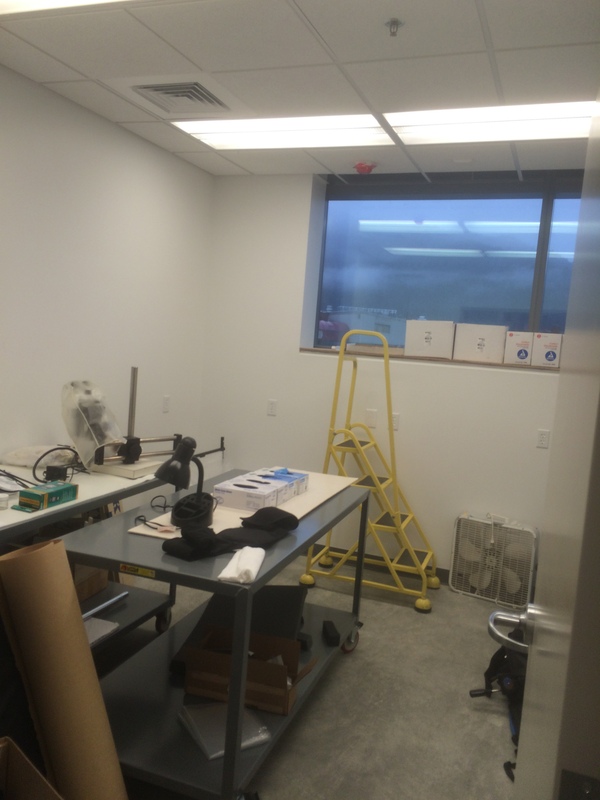 Not to mention getting set up in a new temporary space for the next two or three years. 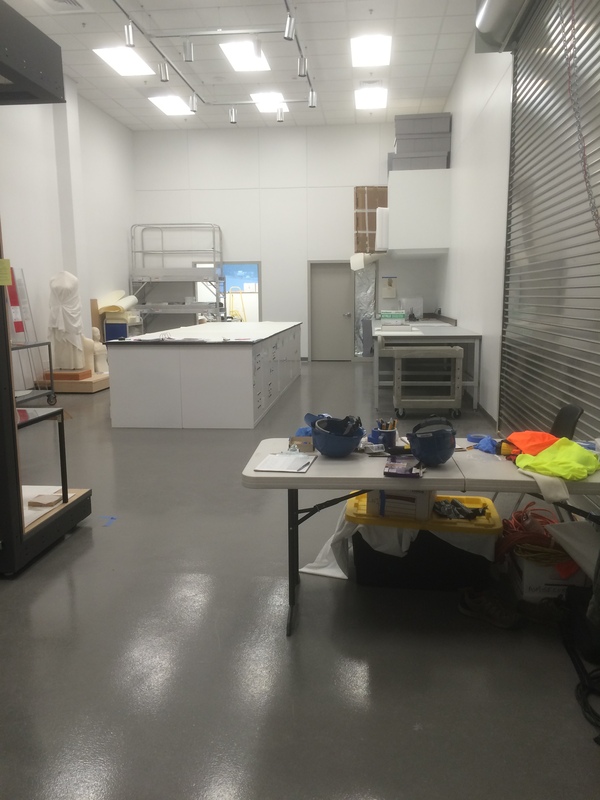 The new exhibits are supposed to open in May of 2016, and of course new exhibits have lots of conservation needs. Here’s hoping the temporary lab can handle the workflow. 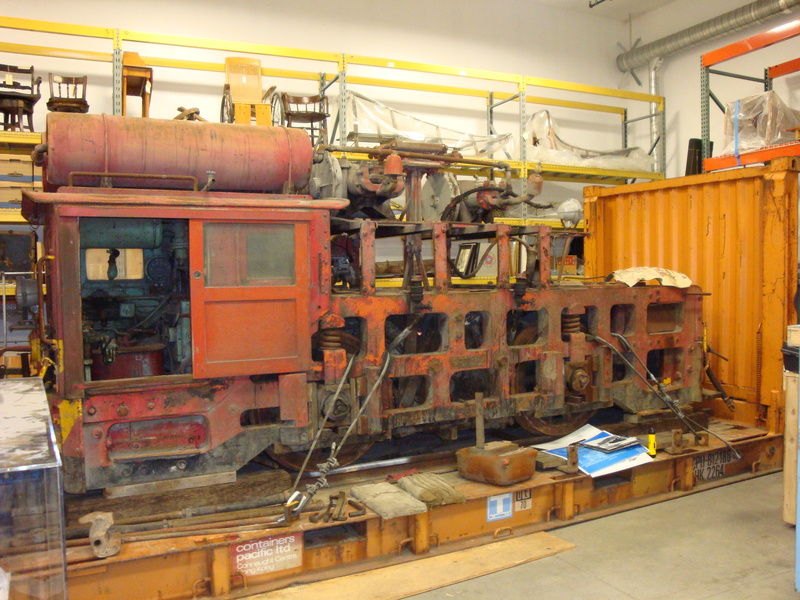 Mining is an important part of the history of Alaska, and we were lucky to receive a donation of an original locomotive from the heyday of Juneau hard rock gold operations. It was donated by the California State Railroad Museum a few years ago. It had been significantly altered during its time with the Santa Cruz Cement Company and needs significant restoration, but will be an important part of the new exhibit galleries. 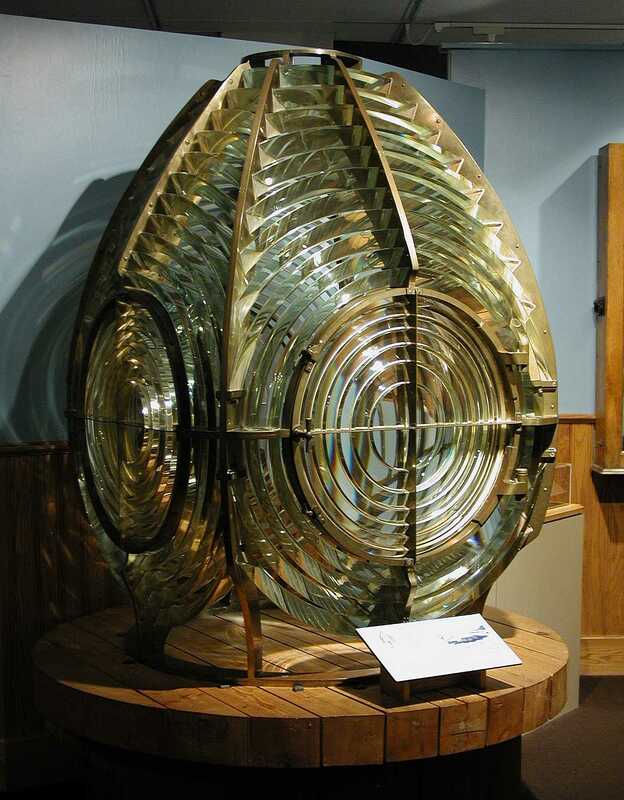 Our 3rd order Fresnel lighthouse lens is not in bad shape, but it wil be a delicate operation to move it. Formerly located within Cape Spencer Light Station in S.E. Alaska from 1925-1974, it was made and constructed by Barbier, Bernard and Turrenne of Paris. I continue to chug along on work for a PhD in anthropology, with a focus on the cultural meanings of internal organs of marine mammals. Those would include organs like stomach, intestine, bladder, and esophagus from animals like seals, walruses, and sea lions. 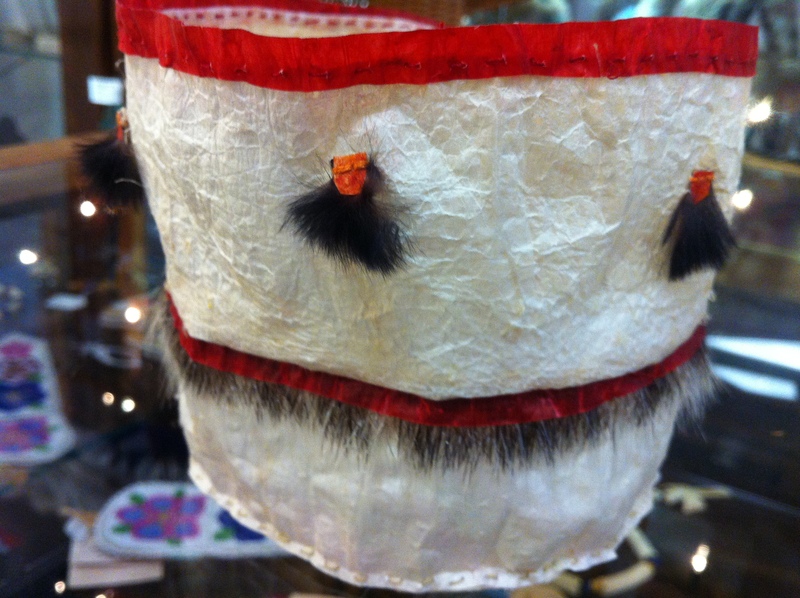 Yup’ik, Siberian Yup’ik, Inupiaq, Alutiiq (Sugpiaq), and Aleut (Unangan) cultures all have traditions of making items like rain parkas, sails, windows, containers and drums out of these materials, but they are rarely used today and poorly understood in musuems. 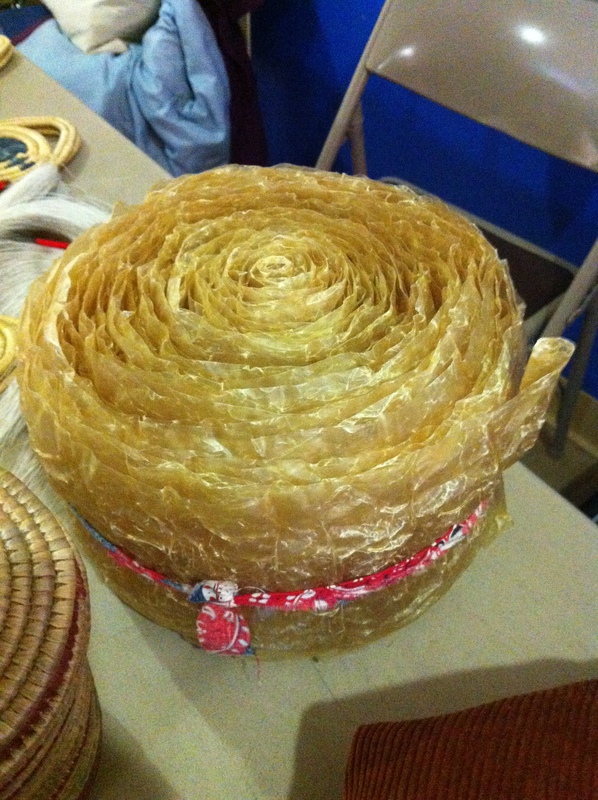 I am hoping to work with Native people to understand the meanings of these materials better. 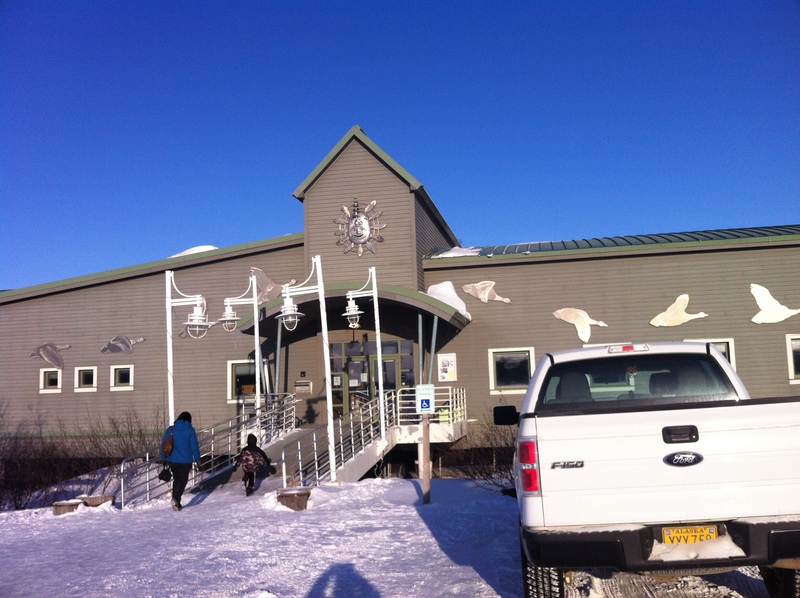 Just last week (March 21-25) I went to Bethel with my 5-year-old son, Carson, to see the Cama-i dance festival and meet the new director of the Yupiit Piciryarait Museum, Eva Malvich. 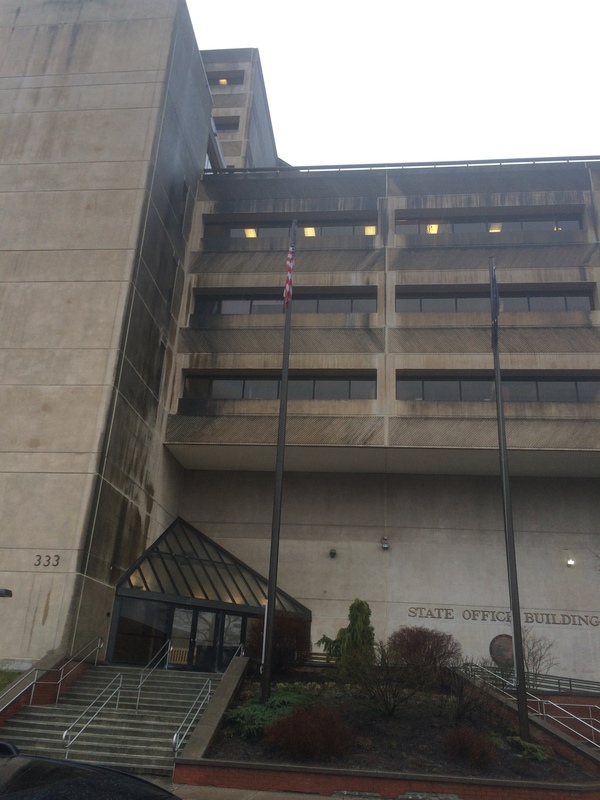 I had never been to that part of the state before, and was eager to see if there might be possibilities for collaboration between our two museums as I work on the gutskin project. It was the most amazing experience to be there…the people were just wonderful and I really look forward to going back. 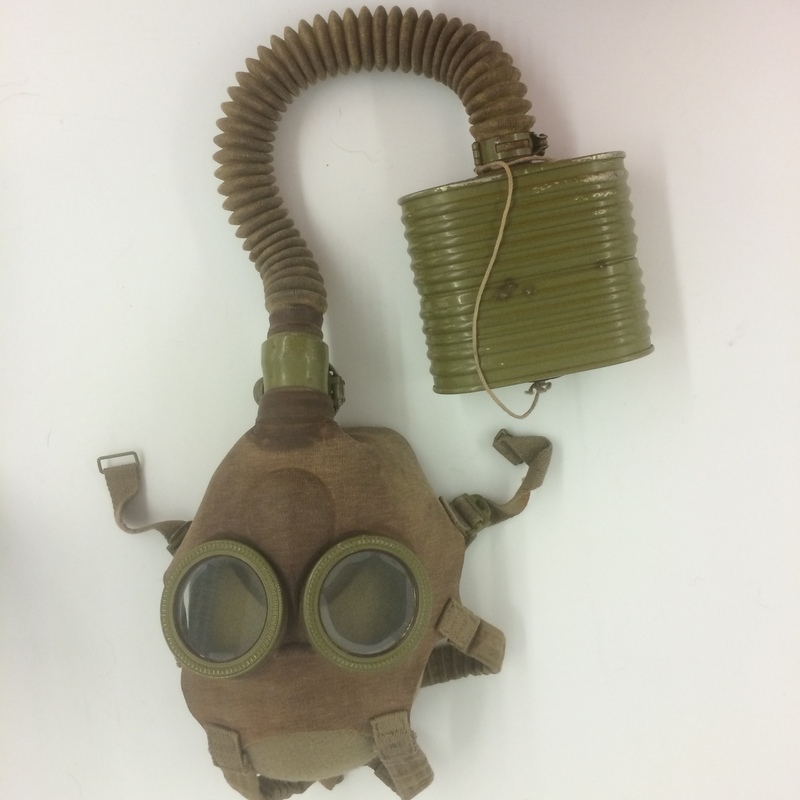 I am heartened that people do seem interested in this kind of project, and it seems that I might have something I can give back with my knowledge of conservation and museum practices. 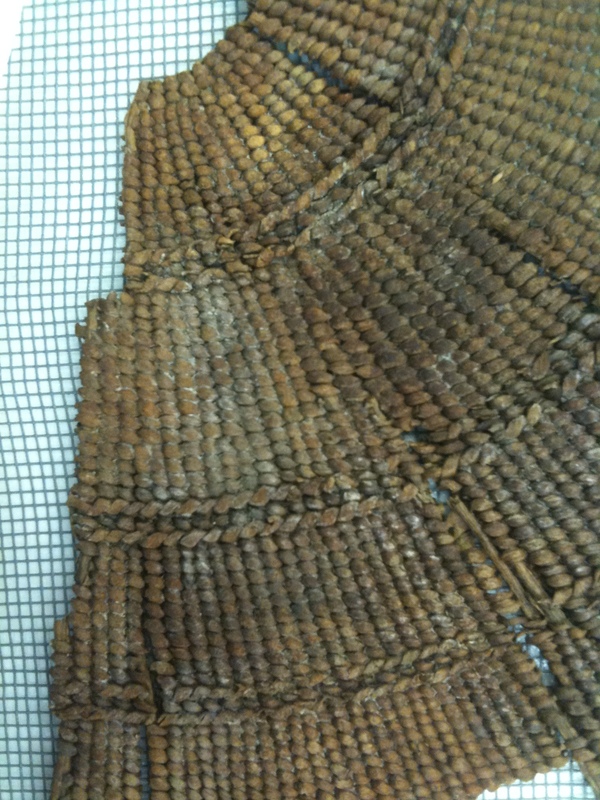 After quite a long haul, I will be presenting a paper at the WOAM conference on the final results of PEG treatments on ancient baskets at the Alaska State Museum. Dana Senge and I have been working on this topic for quite some time, and will be co-authoring the paper. WOAM is the acronym for the Internation Council on Museums Conservation Committee working group on Wet Organic Archaeological Materials, and the triennial meeting is in Istanbul, Turkey this year. My husband Scott Carrlee (also a conservator) and I both had terrific experiences doing conservation fieldwork in Turkey in the 1990’s and are really looking forward to showing our son the joys and pleasures of Turkey. Hoo boy, all the above would be plenty if it were not for the twenty-odd big totes of wet shipwreck materials awaiting treatment in off site storage. They froze solid last fall while I was in Fairbanks (leave of absence to take coursework for the PhD) and are just now beginning to thaw. I have thawed out the five most troublesome ones, I think, and the materials are in an amazing state of preservation. The wreck was a gold rush era luxury steamship, and we have leather, textiles, ceramic, glass, rubber, tools, jewelry and more. 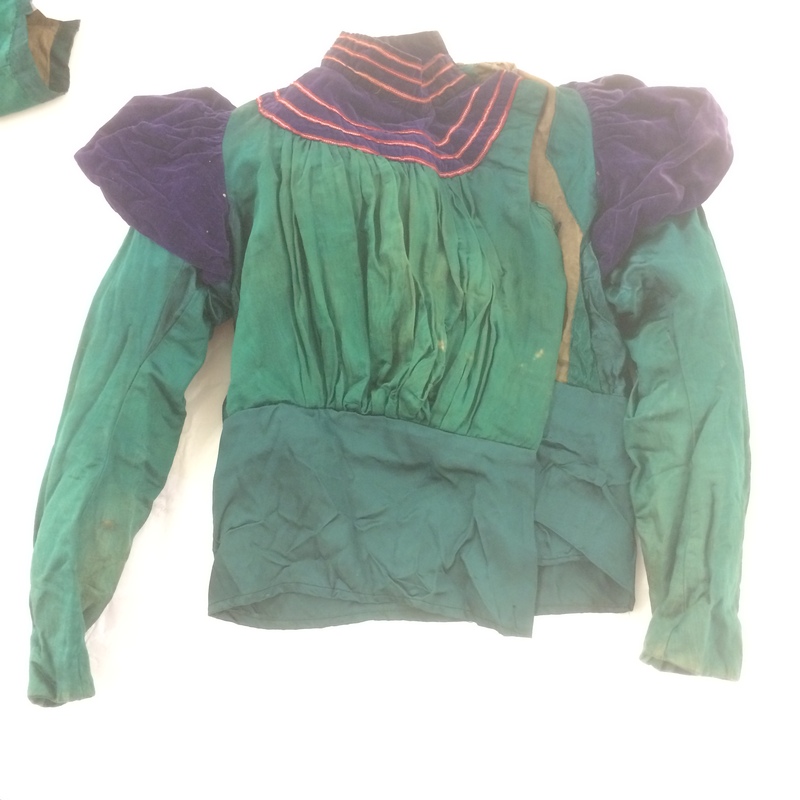 I’ve dried out two full suits (jacket/ vest/pants) and numerous other garments, very similar to the ones in the 1902 Sears catalog. 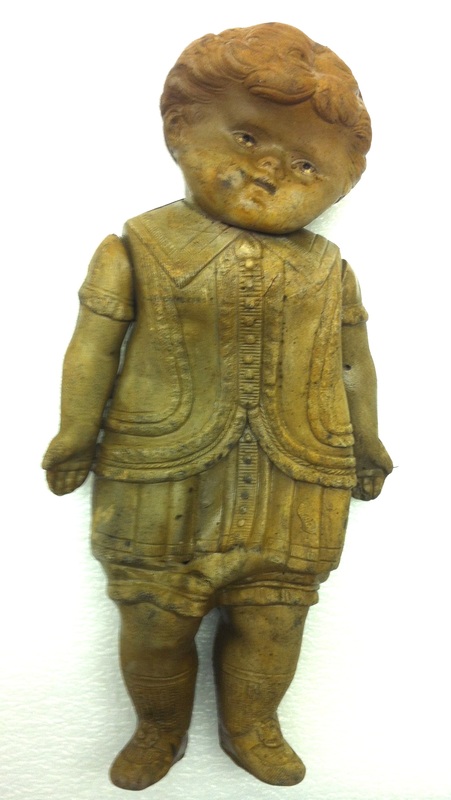 My favorite item so far is an amazing doll about 9″ tall that I believe is made of gutta percha. The doll is over 110 years old, and in remarkably good condition. 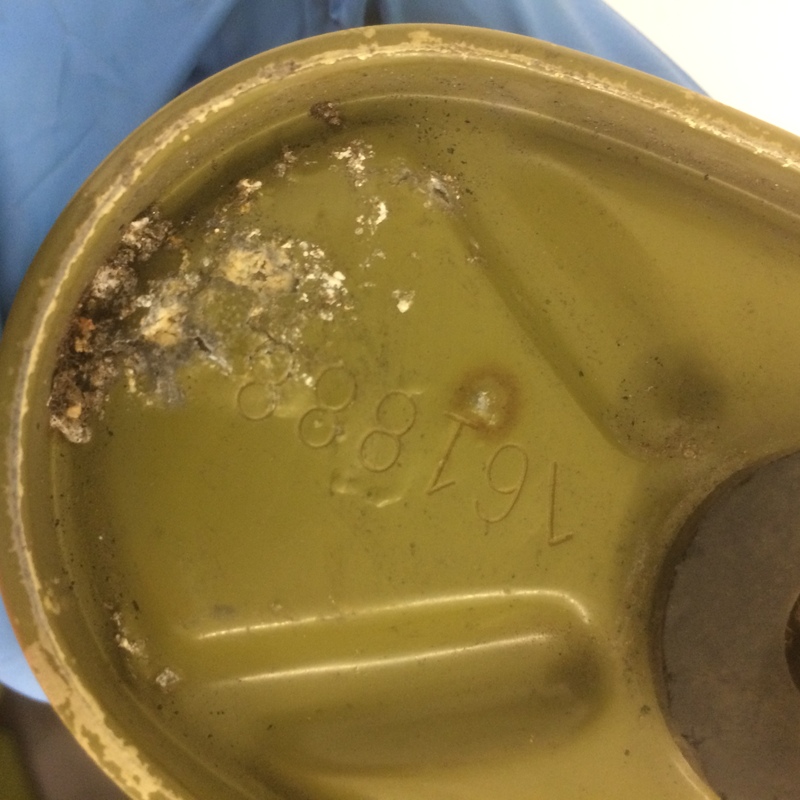 I will be putting it in anoxic storage to slow the deterioration of this material. 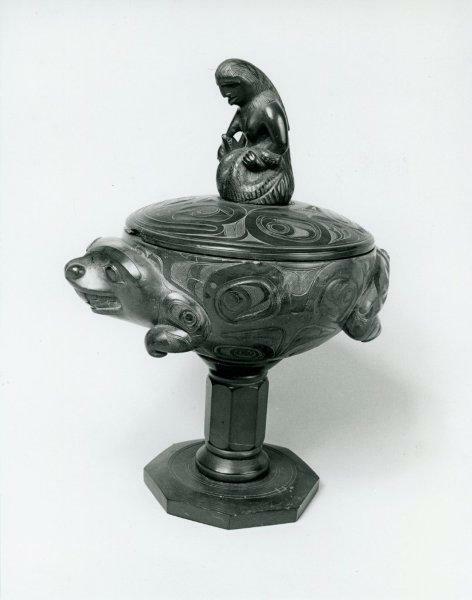 Stay tuned on this one…the Alaska State Museum and its branch in Sitka, the Sheldon Jackson Museum, have loaned several important masterpieces to the Vancouver Art Gallery for a major retrospective exhibition of the argillite masterworks of Haida artist Charles Edenshaw. The descendants of the artists are involved in the exhibition and catalog, and the artworks will be accessible to many more Haida people than ever before. However, argillite is a strange material, a carbonaceous shale from a single quarry in Haida Gwaii, the homeland islands of the Haida people. The quarry no longer produces large pieces, so the number of large artifacts made from argillite are limited. Argillite is barely stone, and still retains some properties of clay, including being humidity sensitive. The ability to exapand and contract with changes in humidity is different in different directions due to the bedding plane layers of the material. When it breaks, the break edges are often crumbly. One artifact in particular, a large compote, has a diagonal fault line of quartz through its load-bearing pedestal. 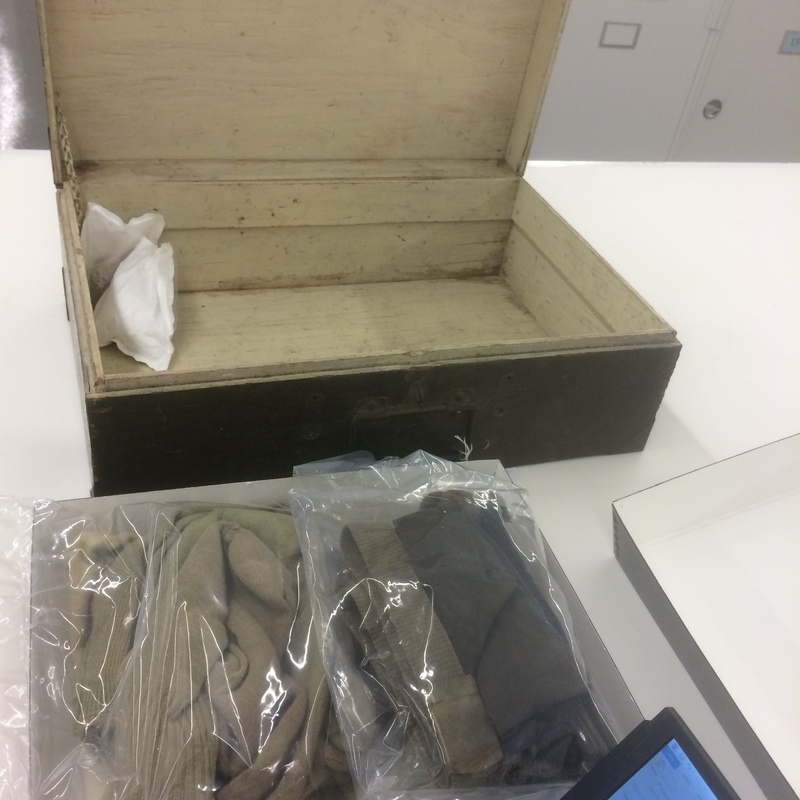 After a long and careful decision-making process, musuem staff decided the value of sending the artifacts to be seen by Haida people was worth the substantial risks to the artifact. 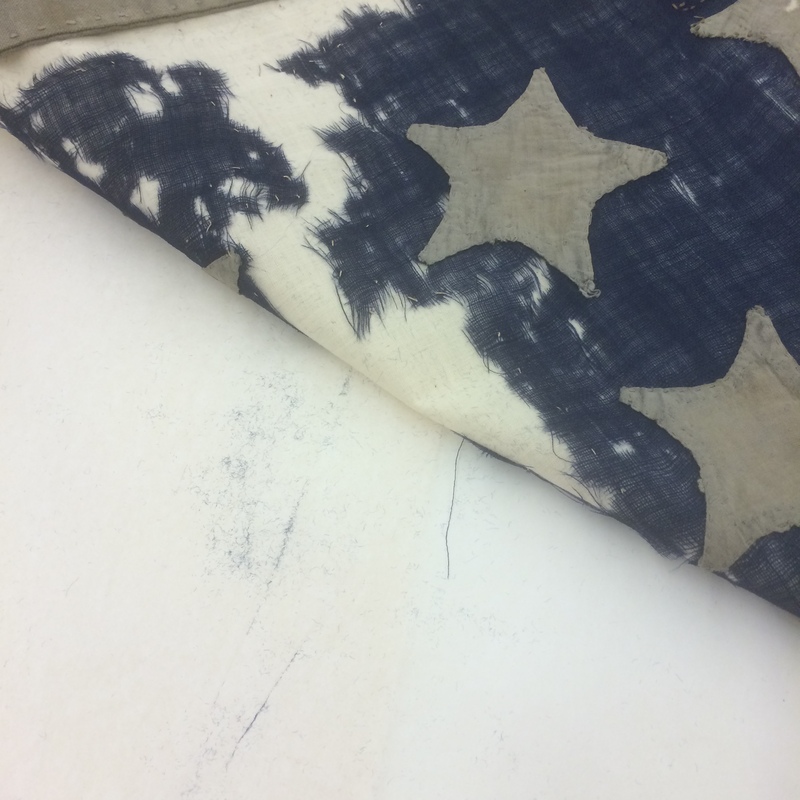 I think it was the right decision, but really nerve-wracking for a conservator!